As the strategic lead for ILT at Bolton College I am always keen to showcase the ILT projects that are underway across the College. If you wish to learn more about these projects please email me at aftab.hussain@boltoncc.ac.uk. I am pleased to announce that Bolton College was awarded the Association of Colleges' Beacon Award for education technology on the 22nd of March 2019. The award was given for the College's work on its campus chatbot and digital assistant, Ada. It was a pleasure to attend Digifest19 on behalf of Bolton College with my colleague Dean Baggaley who is the Lead Systems Developer in the College's Learning Technology Team. 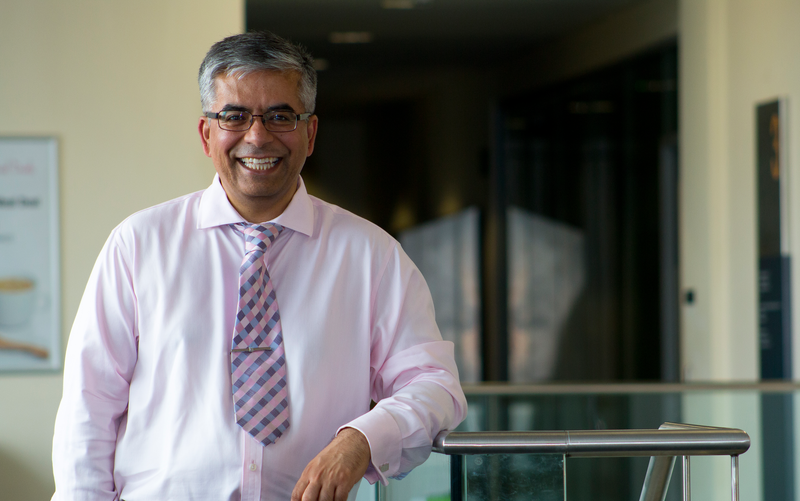 The following video was kindly commissioned by Jisc for Digifest19 and it was filmed by Suited and Booted. The following video is our presentation on Bolton College's Ada service. The presentation demonstrates how Ada can respond contextually to questions posed by our students and teachers. It also describes the emergence and evolution of campus digital assistants. It was also a pleasure to talk to Gavin O'Meara from FE News about our current and future work on the College's digital assistant. Bolton College has published an Android app for its Ada service. In its present state, the app enables a student or an employee of the College to pose a question to Ada (the College's digital assistant) and she returns a verbal, textual or multi-media response back to the person making the enquiry. In its next iteration, the app will offer nudges to students. These nudges will offer information, advice and guidance on a wide variety of topics and College services. For instance, a nudge could offer information about a forthcoming hand-in-date for an assignment and it could also advise the student about the grade required for that assignment if the average grade profile is to be maintained or increased. The app marks a significant milestone for the College because it offers immediacy to every student, teacher and support team at the College. But more so, it presents the College with a wonderful opportunity to give everyone on the campus access to a personal digital assistant to support their studies or work. Bolton College's Ada service has started to nudge students with timely and contextualised information, advice and guidance (IAG) to support their studies. The service nudges students about forthcoming exams, their work placement feedback and more. In the following example, a student receives feedback regarding his work placement from his career coach and employer. The College is currently implementing ProMonitor, which will offer our teachers and tutors with a scalable solution for managing and supporting the progress made by their students. Once ProMonitor is in place, Ada will be in a position to nudge students about forthcoming assignments and the grades awarded for those assignments. She will also offer students advice and guidance about staying on track with their studies. Likewise, Ada will nudge teachers and student support teams to inform them about student progress; allowing for timely support to be put in place for students across the College. Bolton College will work closely with colleagues at the University of Bolton to design, refine and develop the Ada nudge service. The project team will examine if the service supports improvements across a number of key performance indicators such as attendance, retention, grade averages, value added, well being, completion and progression onto further studies, training or employment. Besides serving as a traditional oracle for everyone on the campus, the advent of the nudge service enables Ada to start behaving as a digital assistant. Regardless of the number of students who are registered at any campus, digital assistants like Ada are able to operate at scale, offering timely, personalised and contextualised IAG to every student. It's important to note that the contextualised nature of nudges makes them function very differently from the traditional notification service that are found on campus apps. The difference will become more stark as campus digital assistants mature. For example, a student uses the College's AutoMark service. The service marks his work and assigns a pass in its feedback to the student. However, Ada reminds the student that he needs to secure a merit grade on this particular piece of work if he is to maintain his grade average. Please note that the nudges described thus far represent a small fraction of the services that a campus digital assistant could potentially support students and teachers with. What will happen when Bolton College's Ada service starts to nudge students, teachers and support teams? 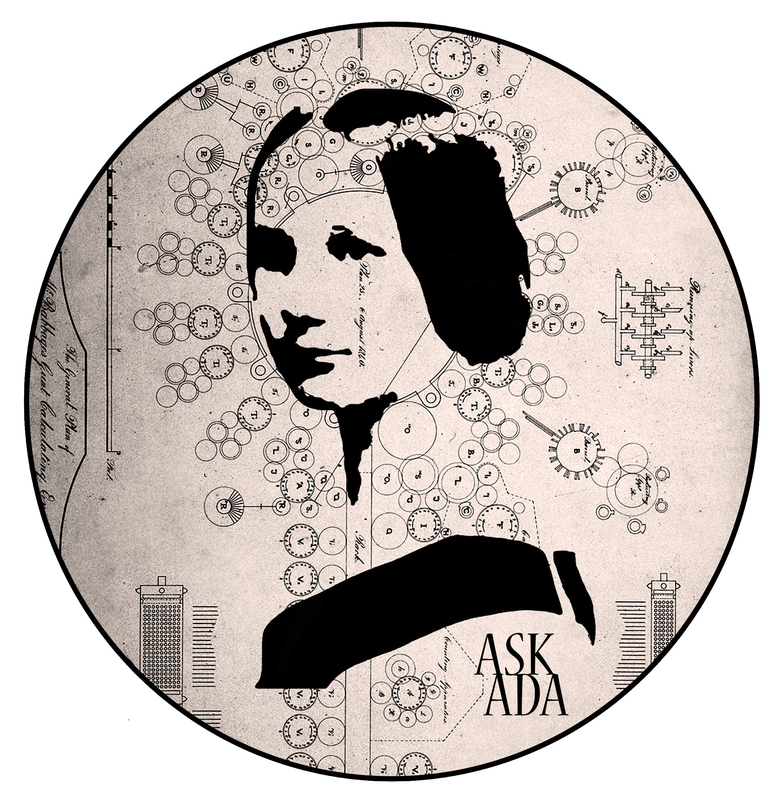 As a chatbot, Ada can respond to a large variety of questions from students and colleagues. As a digital assistant we would like Ada to nudge, prompt, remind, assist, inform, direct and advise students with their studies, and we would like Ada to do likewise for teachers and support teams. If colleagues are successful with this project it will mark a significant milestone in the evolution of the Ada service because it will enable Ada to act as a true campus assistant for everyone on the campus. Nudge theory in an education setting uses positive reinforcement to influence desired behaviours in students. Desired behaviour may include students aspiring to achieve higher grades, students submitting work on-time or students making applications for a higher education course. 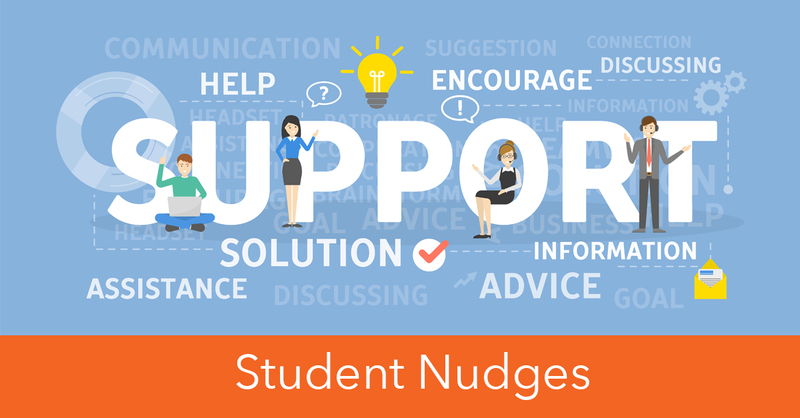 Nudges are not a new device that are used by teachers and student support teams. One only has to walk around a typical campus to get positive signals - just look at the posters around the campus or the smile on a teacher's face as you walk into a classroom. How are nudges applied by a campus digital assistant? Tom's grade average has slipped. Ada picks up on this trend and offers him an appointment to meet his subject teacher. Tom can chose to accept or decline the offer with ease. Hilary wants to go to university: Ada reminds Hilary that she needs to secure a distinction grade on her next assignment if she is to maintain her target grade to secure a place at university. Ada also reminds Hilary about a forthcoming event on the campus for students who have applied for university. Habid gets a merit grade on his last assignment: Ada offers her congratulations to Habid for securing a merit grade. She says that he is only a few points away from averaging a distinction grade on his course. Ada also suggests to Habid that he is in a position to apply for a university course. She offers Habid an appointment to see the College's Student Services Team. In each case Ada offers the student contextualised and timely information, advice, support, guidance and a call to action. 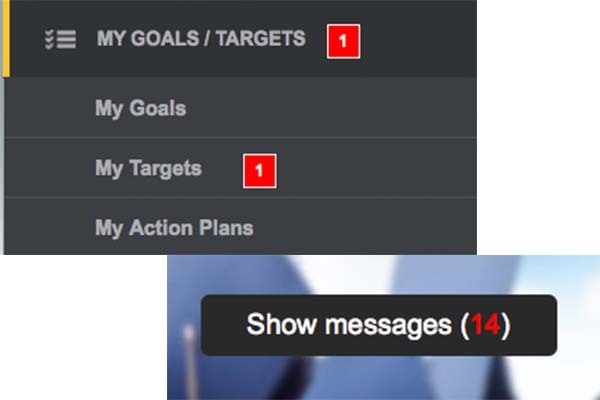 With context and insight, these nudges are able to operate very differently from traditional notifications. If these nudges operate well they could lead to an increase in the desired behaviours on the campus; leading to improved student retention, more students succeeding with their studies and an increase in the number of students who progress to further training, education or employment. Bolton College's nudge service will be available via the student and staff home pages, the College's iOS and Android voice first apps and over smart speakers such as the Amazon Echo. The following video from Bolton College demonstrates some of the #VoiceFirst capabilities of Ada, the College's digital assistant for students, teachers and support teams. Students at the College can interact with Ada through an array of Amazon smart speakers such as the Echo, Echo Dot, Echo Show and via the Alexa app on iOS and Android smartphones. a campus manager may ask Ada through Alexa to show the latest enrolment figures for each of the departments across the College. In each case, the student, the teachers and the campus manager interacted directly with their smart screens and their campus digital assistant rather than the traditional web applications to illicit the information that is desired. Bolton College is honoured to be referenced by Damian Hinds, England's Secretary of State for Education, for its work on campus chatbots and digital assistants at this year's BETT Show (4mins 25secs). Ada, Bolton College's digital assistant has been responding to student questions since April 2017. In January 2019, the Ada service started to support teachers with everyday enquiries about student progress. The service is proving to be very effective at reducing the time taken to find information to support course administration and student progress. 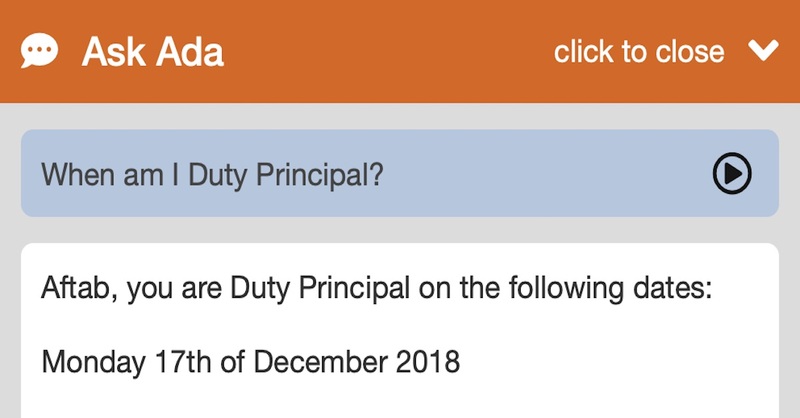 When am I Duty Principal? Managing staff rotas can be a challenging exercise at times; especially when individuals forget the date or the time of their slot. Could a chatbot or a digital assistant help organisations manage their staff rotas more effectively? At Bolton College, its staff facing chatbot is now in a position to support staff with the Duty Principal rota. When the service goes live at the start of the new year, the chatbot will automatically notify colleagues in advance of their Duty Principal slot; saving valuable time for colleagues who are responsible for this simple but repetitive task. Colleagues will be able to ask the chatbot a variety of questions about the rota such as: when am I Duty Principal, who is the Duty Principal tonight, who is the Duty Principal tomorrow, who is Duty Principal this week, who is Duty Principal next week and so on. If students need to get in touch with the Duty Principal to discuss any matter on the campus they can do so via the College chatbot. It’s yet another use case for campus chatbots. It’s simple to use and it is very effective at distributing important information around the campus. There are multiple contexts in which this service could be put to use. For instance, the service could be used by the College's careers team, the student finance team or by tutors to organise and share information about appointments with students. Once set up, students will simply converse with the campus chatbot to seek out information about their appointments. As Bolton College's chatbot service develops further staff will be able to ask questions such as: when is my first probationary meeting, when is my appraisal, when is my one-to-one meeting with my line manager, what meetings have I got scheduled with students this week, when am I Duty Principal, when am I supporting the parents' evening event and many others. Likewise, students will be able to ask the campus chatbot the following questions: when is my one-to-one tutorial with my tutor, when is my appointment with the careers team or when is my appointment with the student finance team. This is in addition to questions regarding exam dates, work placement dates, events around the campus and more. The chatbot service will increasingly become more assistive as it prompts and guides students during the course of their studies; and as it guides staff when they carry out day-to-day tasks to support students across the campus. In order to deliver this level of service, the digital assistant will need to interact with a greater number of datasets (those that currently exist and those that need to be created to serve the needs of students and colleagues) and it will need to operate with a greater degree of context. Without the latter, the chatbot will never develop to be a true digital assistant. As always, students and staff will be able to seek out answers across multiple modalities such as the web, mobile and over voice only devices. 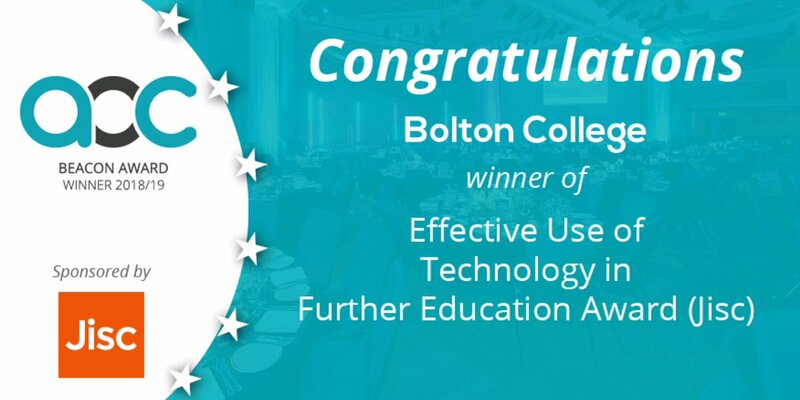 Bolton College has been announced as a finalist for this year’s Effective use of Technology in Further Education Award from the Association of Colleges. The College has been shortlisted for its work on Ada, the campus chatbot for students, teachers and support teams. The chatbot has been supporting students since it was launched in April 2017. The awards ceremony will be held on Friday 22nd March 2019 at the Grosvenor House Hotel in London. 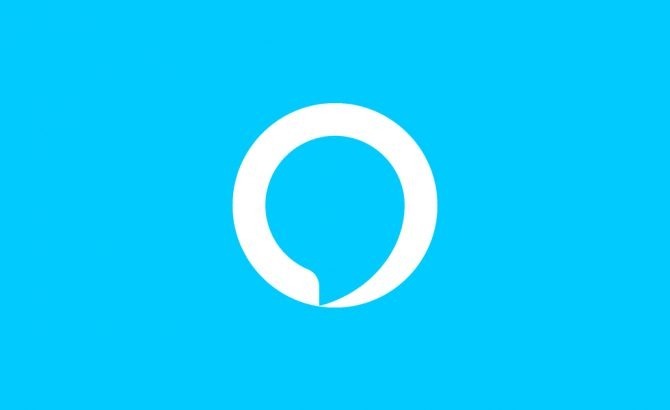 I am pleased to announce that Bolton College has published its Alexa skill for its chatbot service. Once our students have enabled and authenticated with the Bolton College skill they can get answers to a myriad of questions about the College, campus services and their studies. The open architecture of the IBM Watson and Amazon Alexa platforms enables our students and teachers to pose a question to an Echo smart speaker and get an answer back from Alexa via the IBM Watson service and our campus chatbot Ada. We are also currently training the service to respond to a growing library of questions from our teachers and support teams. The staff facing chatbot service is being designed to reduce the time taken to search and compile information about student progress at an individual, department and college wide level. For example, a curriculum leader could ask the service 'which students are out on work placement this week' and be presented with an answer in a fraction of a second. When Bolton College's Alexa Skill gets coupled with a screen such as an Echo Show, the service could prove to be a powerful tool for teachers, support teams, curriculum leaders, managers and directors as they access information to support their students. We envisage that Voice First or conversational services will simplify and improve the way students and colleagues access information to support their studies and work. It also represents a significant shift in the way students and staff will engage with online College services. They simply have to converse with our College chatbot which will be present on the student and staff home pages, on iOS and Android phones and on smart speakers such as the Amazon Echo. Colleagues across Bolton College have started to train Ada, the campus chatbot to respond to everyday questions from staff. The College's Human Resources Team is the first team on the campus who have started to teach Ada how to respond to some of the most common questions that are presented to them. 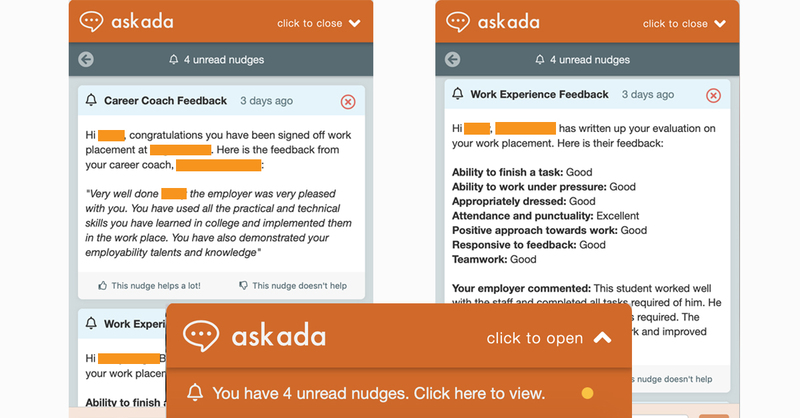 In the following two images Ada responds to a question about logging into the College's HR system and the other shows how the campus chatbot responds to an enquiry about the College's cycle to work scheme. The ability to incorporate multi-media into the chatbot's responses allows for comprehensive answers to be presented to colleagues who are seeking information about College services. The chatbot will also offer contextual responses to questions such as "how many holidays have I got left? ", "show me the latest holiday stats on my team?" or "who is in next week? ", "what's my staff development record looking like for this year? ", "what staff development activities are taking place this week on the campus?" In the new year, colleagues will also be able to seek answers via Bolton College's iOS and Android apps for the Ada service. The ILT Team is making good progress with this particular project and we hope to post an update before the end of the year. the development of an automatic marking service. 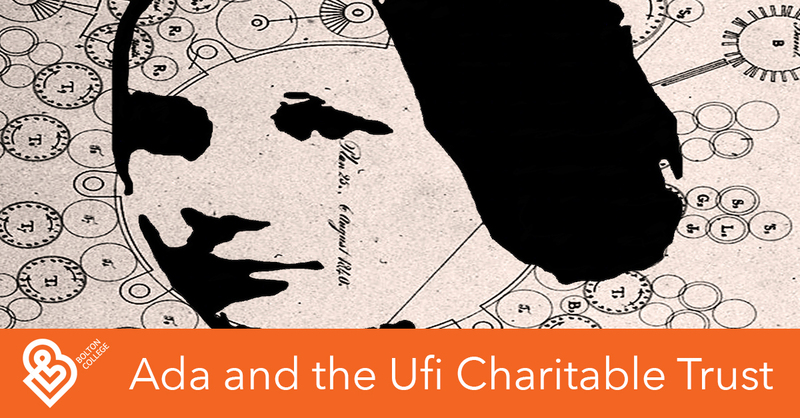 The support from the Ufi Charitable Trust will enable students at the college to make use of the campus chatbot service over their iPhone and Android smartphones. Students will simply pick up their phones and ask Ada their questions through voice or text input. This enables the college to offer the Ada chatbot service through multiple modalities; namely the web, mobile and over smart speakers. These services are important to the college because they add considerable value to the overall student experience. The on-demand nature of these services enables immediacy and access to timely and accurate information for every student at the college. Bolton College's student facing chatbot service has been operational since April 2017; and it continues to offer consistent and reliable support to students for everyday enquiries. The advent of the chatbot service on the staff home page will offer teachers and support teams the opportunity to pose questions to Ada. In the first instance, the chatbot will respond to day-to-day enquiries about campus services. Going further, we envisage training the chatbot so that it can support complex enquiries from colleagues. For instance, the chatbot could answer questions that seek out the students who are going out on work placement next week or the students who are performing below their target grades and so on. 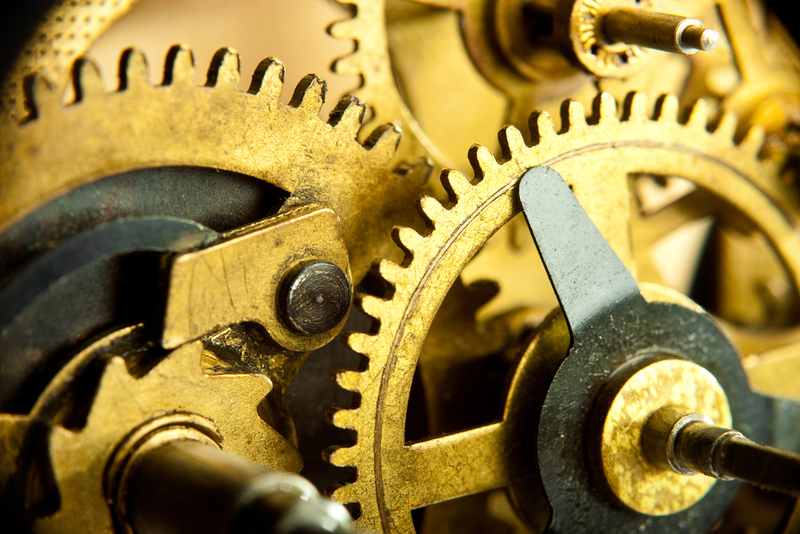 The automatic marking project has been designed to support students as they complete their work placement evaluations and to reduce the assessment workload for the college's team of Career Coaches. The project aims to enhance the quality of work placement evaluations that are completed by students across all academic levels. Bolton College is particularly interested in exploring the affordances that could be derived from these services. From the work that we have completed over the last two years we anticipate that they will be many and wide ranging. We	look	forward	to posting updates on these projects over the coming year. How will Ada support teachers? provide insights regarding the progress made by students across the campus. In addition, Bolton College's Ada service for teachers will be used to support colleagues with enquiries about the College's teaching, learning and assessment standards. Teachers may ask Ada about differentiation in the classroom, how to improve feedback to students, questioning techniques in the classroom and so on. When the teacher facing Ada project gets underway the answers to these questions will be curated by the College's Quality Unit, its team of Advanced Practitioners, the Staff Development Team and by teachers from across the College. As the teacher facing Ada service develops we envisage that teachers will ask Ada about the academic progress that is being made by individual students. For instance, Ada could answer the following questions for a teacher: what's the average grade profile for student X, show me the students who are currently performing below target levels, could you show me the students in my class who are doing a GCSE retake in Maths, who is going out on a work placement next week and more. The introduction of the teacher facing Ada service promises to change how teachers engage with student data and how they gather insights regarding the progress made by their students. At the present moment in time, the ability to ask a chatbot questions in a natural conversational manner about student progress is rare; but in the near future, this will be the norm in our schools, colleges and universities. I hope to post regular updates on this project over the course of the next academic year. Bolton College's Careers Advisors and the Information Learning Technology Team are making good progress to produce an online service that will help students compose CVs. The service takes advantage of robotic process automation which removes the need for students to populate much of their CVs. In addition to the student's name, contact details and educational qualifications; the data from the College's work experience and social action apps will also feed into his or her CV. Multiple CVs can be created, saved and edited to meet the needs of each job that the student applies for. 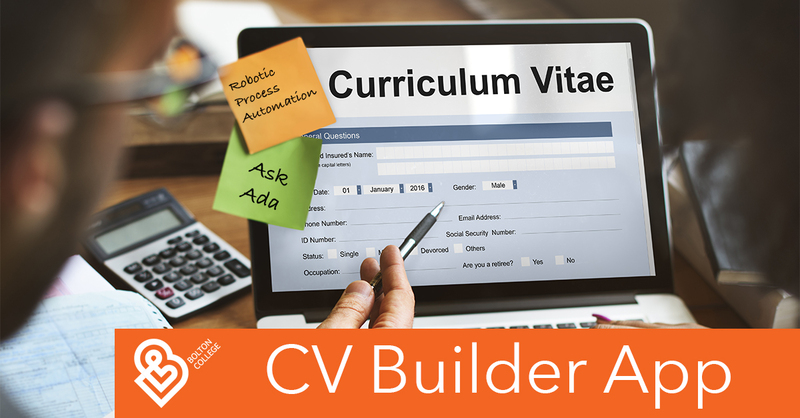 As with any new service that is being developed by Bolton College, the Ask Ada service will be embedded into the CV Builder App which will enable students to ask for advice and guidance when composing their CVs. The Ada service augments the capabilities of the College's Careers Advisors Team; and it allows them to offer support to students on writing CVs at scale. The service will be available to all students on the campus from this September. As these services become more capable; and as our understanding of cognitive services within the education sector develops we hope to embed the Ada service into a wider range of student facing services. The introduction of intelligent process automation will mark the next major milestone for Bolton College and its Ada service. It promises to enhance numerous services such as the College's adaptive online learning solution; the information, advice and guidance that is offered to each student on the campus; the transactional capabilities of Ada; and the management of every point on the student life cycle. The ILT Team at Bolton College is exploring the use of a floating web chat window for the College's Ada service. The team envisages that the new interface will sit on top of multiple services such as Moodle, the College's learning management system; the institution's student and staff home pages and the work experience and social action apps that are currently in development. At a simple level the web chat window will enable students and colleagues to ask Ada questions regarding the web site that they are engaged with. For instance, if a student needs to ask a question about any element of the College's work experience app he or she just needs to open up the web chat window and ask Ada a question. The Ada service can respond with text, voice, hyperlinks, images and video. Here is a short demo of the Ada web chat window (there is no sound). As the Ada service develops students and colleagues will be able to carry out various day-to-day tasks that are associated with other College web based services within the Ada web chat window without opening the website or app associated with that particular task. For example, a colleague could use the web chat window to make a room booking on the campus or to request annual leave from work; and a student could submit an assignment, make an appointment with the careers team or renew his or her library books. At the present moment in time the interface on the web chat window lends itself to simple transactions. Whether the service could support complex transactions remains to be answered. However, if complex tasks can be broken down to a series of simple tasks and routines students, teachers and support teams may well be able to perform complex transactions within the interface; especially when text, speech and semantic support are all coupled together. It is very likely that edtech companies that serve schools, colleges and universities will begin to embed chatbots on their platforms and native apps to answer the myriad of questions that are posed by students, teachers and support teams. Chatbots will be present on learning management systems, information management systems, CRMs, library management systems, building management systems, student and staff home pages, parent portals, institutional websites and more. With regard to teaching, learning and assessment chatbots will be on every page across a learning management system and they will be embedded in every online tutorial. If you are currently using or exploring the use of augmented reality, mixed reality or virtual reality to enhance the learning experience of your students; imagine how these could be enhanced when students are able to engage with a virtual cognitive assistant within these environments. The ILT Team recently deployed the Ada service on Bolton College's work experience app. When students engage with the service they are able to ask Ada questions about the app, their work experience programme, their studies, questions relating to the College and more. The ILT Team envisages that the Ada service will gradually manifest itself on other College platforms. The one that is of particular interest is Moodle, the College's learning management system. Once the Ada service is coupled with IBM's Watson Discovery service it will enable students and teachers to make semantic enquiries on the institution's Moodle course library. Ada's ability to respond to student enquiries enables teachers and support teams to extend their capacity to support students when they are away from the classroom or the campus. The service will improve further when students are able to ask Ada questions on their mobile phones. 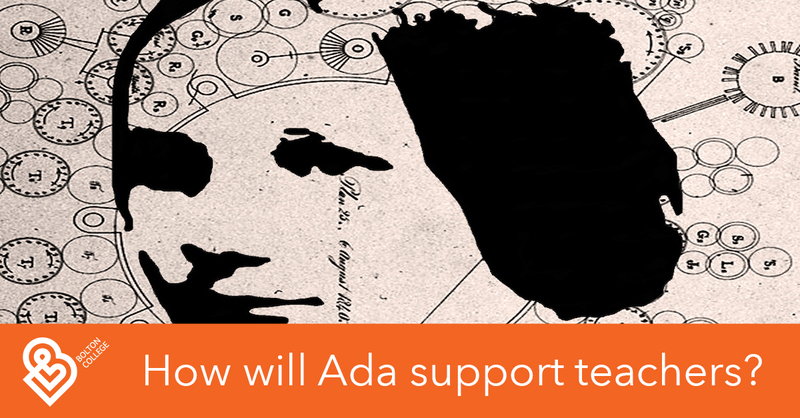 Cognitive assistants like Ada are set to become common place within the education sector. These services will be embedded in every online service or app that students, teachers and support teams use to support their day-to-day tasks and activities. General purpose cognitive assistants will have specialist knowledge to support students and colleagues as they interact with specific web based services or apps; and they will possess broader knowledge about the institution, its services and life on the campus. In the near future it will be inconceivable of designing, producing, purchasing or using an edtech service that does not take advantage of cognitive services. Just as data enabled the introduction of new products and services within the education sector; cognitive services will go further still by fundamentally altering the way schools, colleges and universities deliver services to their students and their wider communities. Going forward, one of the major issues that will need to be addressed by vendors and educational institutions is interoperability between the various cognitive assistants that will operate on different proprietary services. For example, how will the cognitive assistant on the campus library management system cooperate with the cognitive assistant that resides on the institution's learning management system; especially when these services are owned by companies who operate in different service channels within the education sector? These difficulties led Bolton College to develop Ada as a general purpose cognitive assistant for its students, teachers and support teams. If these difficulties can be addressed one of the most interesting aspects of operating cognitive services within the education sector is their potential to assist students in different capacities. For example, these services could act as virtual teaching assistants, assessors, librarians, concierges, careers advisors, mentors, coaches and as digital assistants on a one-to-one level for every student on the campus. The CRM element of Bolton College's work experience app enables work experience coordinators, career coaches and the learner support team to have oversight of the entire work placement programme. Salesforce enables colleagues to record the work placement opportunities that each employer offers to students across the College. This data informs the CRM element of the work experience app; enabling career coaches to assign students to their respective work placements. Like all further education colleges in the UK, Bolton College has always had the ethos that were possible all eligible students should be given an opportunity to complete a work placement during their studies. The College's learner support team provides support to students with additional learning support needs; and this support is provided to students during their work placement programme. 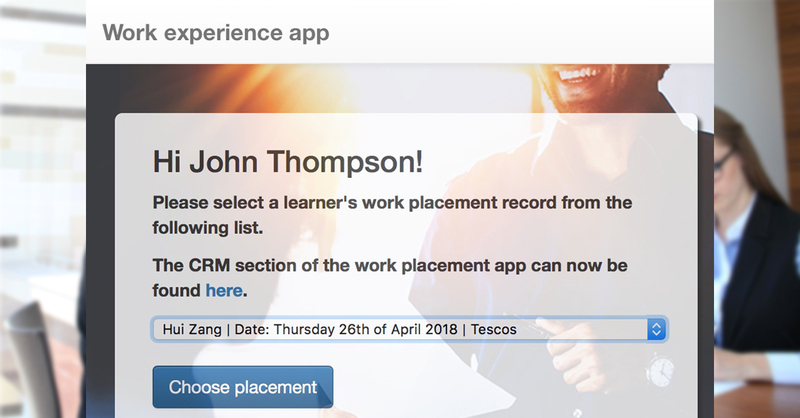 The CRM element of the work experience app enables the learner support team to flag the learning support needs of individual students which in turn informs the work experience coordinators and career coaches as they assign work placements to students. colleagues with detailed analytics on the overall work placement programme at the College. Here is a short video demo and overview of Bolton College's Ada iOS app. Bolton College's ILT Team is building a voice enabled iOS prototype for the Ada service. It marks a significant milestone for the College because it has the potential of enabling ubiquitous access to cognitive services for every student, teacher and administrator on the campus. With the aid of a smartphone, a student simply has to speak to Ada to illicit a response on a wide range of College services and topics. At the present moment in time Ada primarily serves as an Oracle; responding to student enquiries as and when they are raised. Over time, the Ada service, with the support of other semi-autonomous agents will increasingly use its algorithms to prompt, nudge or to engage in dialogue with the student; and do so over the institution's student home page, a voice enabled desktop speaker and screen, a public kiosk on the campus, an embodied AI robot, within an AR or VR environment or via an app on a mobile device. Bolton College recognises that many of the digital services within the education sector tend to be copies or facsimiles of processes, routines and habits that are already becoming obsolete. With this in mind, the College's ILT Team set itself the following question: 'How would traditional artefacts such as learning management systems, student information systems, library management systems, student home pages or the myriad of education smartphone apps be presented or used by a student or a teacher if they leveraged the capabilities of a machine learning or cognitive platform?' The Ada service is our attempt to redefine how educational services are accessed and used by students, teachers, support teams and by the wider community. Bolton College's ILT Team is developing a service that takes advantage of machine learning that will automate the marking, grading and feedback of free form text by students. The service is being developed as part of a wider online package that will support students with their work placement programme. All students are asked to complete an evaluation of their work placement programme which is in free form text; which could be a few hundred words in length. Students typically evaluate four or five aspects of their work placement programme; which may include comments on how they worked in a team, how they applied their problem solving skills, how they developed their communication skills and so on. The service that is being developed by Bolton College will read, comprehend and review the evaluation that is written by each student across all these aspects of their work placement programme. The solution will also grade and offer feedback to the student in real time. The feedback to the student will suggest possible areas for improvement; enabling the student to amend his or her evaluation. "During my work placement I had plenty of opportunity to work in a team. Everyone made me feel part of the project team and I contributed a lot to the project. I really enjoyed it and I learnt a huge amount from everyone." The service takes advantage of natural language classification, natural language understanding and machine learning models. As always, the service will be tested before being presented to students. Once the service goes live each additional student evaluation will improve and enhance the accuracy of the machine learning model that is being used to assess the work placement evaluations. Overtime, the machine learning model will be able to reference many thousands of examples from each of the natural language classifiers that are used to support the model. A key objective of the service is to raise the overall quality of the work placement evaluation that each student submits at the end of their work placement programme. This is another example were a cognitive service can augment a teacher's capacity to support his or her students and enabling students to achieve higher outcomes during the course of their studies. If successful, new marking, grading and feedback machine learning models will be developed to support other contexts; which will be numerous and wide ranging. Bolton College will share more on the project during the summer term. The development of Bolton College's online work experience sytem is progressing well. The application is designed to support students as they prepare to embark on their work placements; it supports them during their work placement period and it supports the student to capture valuable insights following his or her work placement. The service is also designed to support the College's Career Coaches as they administer and support students during the course of their work placements. The following video highlights the main features of Bolton College's adaptive learning environment. The service takes advantage of learning analytics to deliver personalised and adaptive online learning to each student. Adaptive learning environments are representative of a new breed of digital services that have emerged within the education sector over the last decade. They have come about because they take advantage of data and the technologies that support data management. The growing use of machine learning and natural language processing will further escalate the development and use of adaptive learning environments within the education sector. The use of these new artefacts will bring about many benefits to students, teachers and educational leaders; but it must be noted that the introduction of adaptive learning environments will also pose many challenges to all stakeholders within the sector. Click here to learn more about adaptive learning environments. Bolton College's Ada service is now supporting the hairdressing and barbering students on the campus. 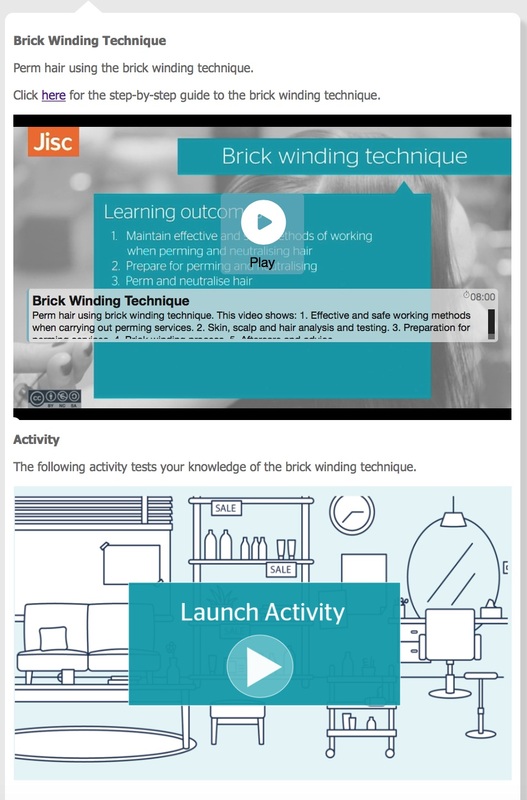 The service makes use of the extensive content library from Jisc which includes videos, step-by-step guides and learning and assessment resources. When students ask Ada about a particular hairdressing or barbering topic they are presented with a rich set of resources to support their studies. One of the interesting aspects of the service is that students do not need to login to the College's learning management system to access these resources. The following image shows an Ada response to a student's enquiry about perming hair using the brick winding technique. The nature of the Ada service allows the teacher to construct a mini-lesson when responding to a student's question. Immediacy is a core design feature of the Ada service because it enables students to access learning and assessment resources with little or no friction. A student simply has to talk to Ada to access on demand resources to support his or her studies. A big thank you goes out to Jisc for sharing these resources. Bolton College's ILT Team is working with colleagues to develop a work experience system to support students and colleagues. One of the early features to be developed is personalised mapping. 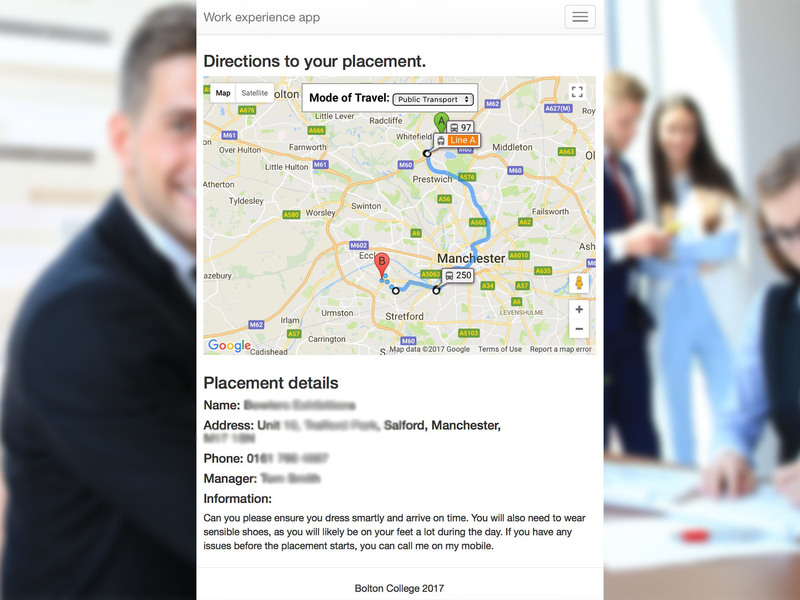 When students engage with the service they will be presented with travel directions from their home address to the work placement address. The following image shows an early draft of how the service could be presented to a student when he or she accesses the service on a mobile device. The advent of the ask Ada service (Bolton College's cognitive assistant for students, teachers and support teams) provides students the opportunity to ask for directions to their work placement even when they are not directly engaging with the online work experience service. Any changes to the student home address or the work placement that is allocated to the student will be automatically carried through to the service. When Ada notifies or reminds students about their work placement, the service will present personalised mapping information to each student. When student and employer data is combined in this fashion it enables the College to deliver services in an attractive manner which has the potential to add value to the overall student experience. Mapping information will also be used to support colleagues when they assign work placements to students across the campus. Bolton College's ILT Team is pleased to announce that it has been shortlisted for the 'outstanding use of technology for improving teaching, learning and assessment' in the forthcoming TES FE Awards ceremony which will be held at the Grosvenor House Hotel, London in February 2018. The ILT Team has been shortlisted for its work on Ada, the College's cognitive assistant for students, teachers and support teams. Ada can respond to general enquiries about the College and life on the campus. The service is used at all hours of the day by students to seek out information to support their time at the College. Ada can respond to specific enquiries from students about their studies. Students may ask Ada about their timetable, submission dates for assignments, exam dates, work placement dates and more. When the service is coupled with natural language generation services Ada can notify individual students about forthcoming exams, events or reminders. The Ada service has already demonstrated its ability to send out timely text messages to students. 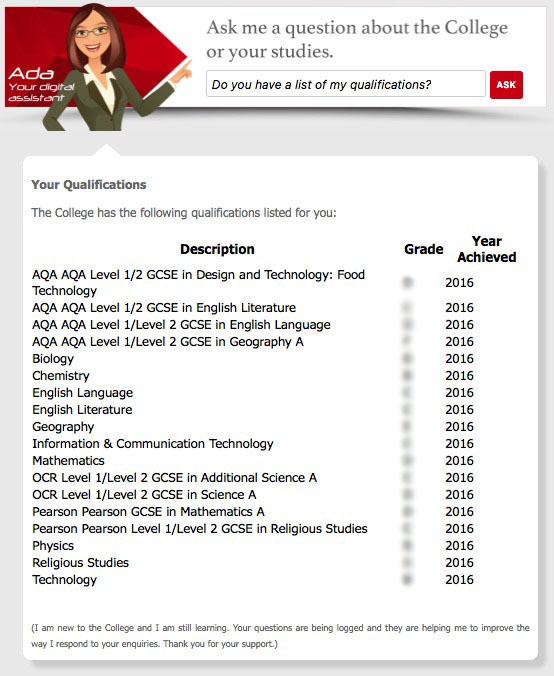 Students can ask Ada for support on a wide range of subject specific topics covering GCSE Maths and employability. The service is currently learning how to respond to questions relating to the following subject areas: beauty, engineering, hairdressing and motor vehicle. Students have kindly offered to support this project. When conversational services like Ada make use of learning analytics, the responses that are offered to each student can be personalised and contextualised to meet the needs of the student asking the question. The College's success in delivering adaptive learning through a learning management system delivers further value to the overall student experience. Ada offers teachers the opportunity to use conversational services in an online tutorial to assess students. In a typical setting teachers and instructional designers may use multiple choice questions or drag and drop exercises to assess student understanding. However, when a conversational service like Ada is used, it can engage in a dialogue with the student, were questions and answers are relayed between the cognitive assistant and student. 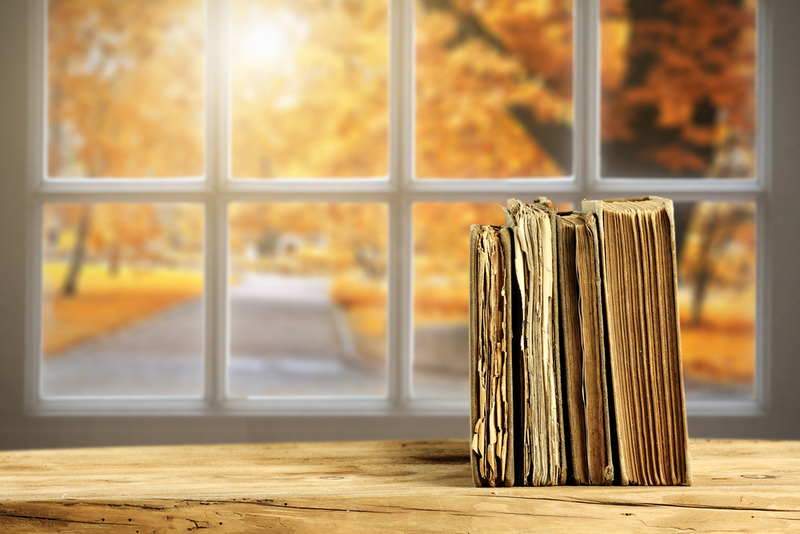 The combination of natural language processing, natural language understanding and natural language generation marks a significant development in the way students are assessed online. The Ada service will also play a significant role when supporting students and colleagues on the College's new work experience system. For example, Ada will automatically remind a student about his or her work placement. The student will be able to converse with Ada to seek out information, advice or guidance about the work placement. Ada will review and assess a student's evaluation of his or her work placement. The Career Coaches at the College will also Ask Ada to support them as they manage the work placement offer. The versatility of conversational services means that they will come to permeate all the digital services that are used by the students, teachers and support teams across the College. We foresee that every point in the student life cycle will be touched and improved upon by conversational services. If you wish to learn more about the use of conversational services or chatbots please visit the IBM Watson Conversation home page. Students, teachers and support teams will have the opportunity to ask Ada about all aspects of the work placement programme. Student enquiries may include: where is my work placement, when is my work placement, show me the directions to my work placement, who do I need to report to when I arrive at the business, I want to complete a new logbook entry, how many hours have I completed so far on my work placement and so on. Colleagues may ask Ada the following questions: are any of my students going out on work placement next week, show me the students who have logged all their work placement hours, show me the students who have successfully completed the work placement programme, who has yet to go out on work placement, how many work placement students did ABC Ltd promise to take on this year and more. In addition to the work experience system students are supported further by a suite of online employability tutorials which are curated to be adaptive. This means that the content and activities within these tutorials adapts and differentiates according to each student's unique profile which changes over the duration of his or her studies at the College. The College plans to trial the new system during the summer term. The service will go live across the College in September 2018. I hope to post project updates when key milestones are achieved. Ada, Bolton College's cognitive assistant for students, teachers and support teams continues to demonstrate its ability to provide on-demand information to students. The service enables students to access information pertaining to their studies and the wider College with little or no friction. The student home page also presents timely, personalised and contextualised notifications to each student. These notifications relate to exams, work placements, class schedules, events on the campus, excursions away from the campus and more. The College's ILT Team is currently exploring how these services could be enhanced through the use of programmable SMS. This would enable the College to send push notifications to a student's mobile phone and to do so at scale. For instance, a student may ask Ada about a forthcoming exam. Ada will respond with the answer and it will also send out a text message to the student with the date, time and room number for the exam. The programmable text messaging service may also pre-empt predicted questions by automatically sending out messages for key milestones and events in the student calendar. 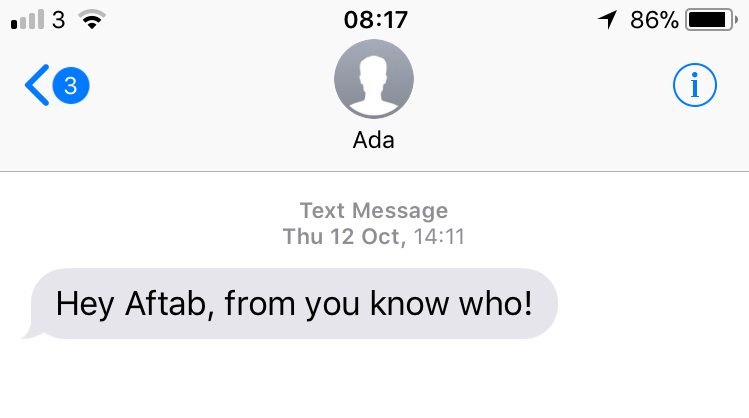 The following text message was sent to my phone from Ada. 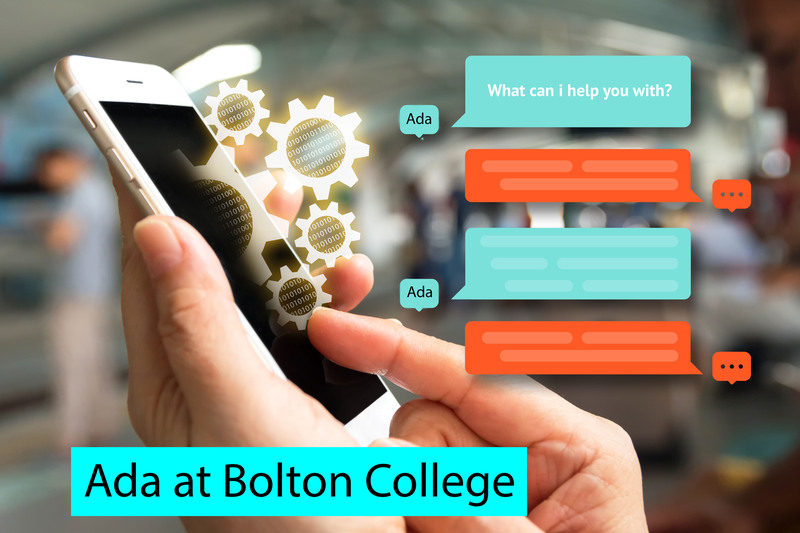 When programmable SMS services are coupled with a cognitive assistant like Ada, institutions like Bolton College can take advantage of another valuable communication and distribution channel to support their students, teachers and support teams across the campus. The ability to operate at scale is a key characteristic of using programmable SMS and conversational services such as Ada. If the institution's dataset can be relied upon these services can deliver real value to students and to the schools, colleges and universities that serve them. Students get access to on-demand information, advice and guidance and institutions get to deliver these services without breaking the bank. Bolton College's ILT Team is pleased to announce that all students and staff at the College now have access to Lynda.com to support their studies, work and professional development. The introduction of the Lynda.com service is part of a broader learning and technology strategy that Bolton College, the University of Bolton and Bolton's University Technology College all share. The news follows the successful introduction of Ada, Bolton College's cognitive assistant for students, teachers and support teams - a first for a further education college in the UK. Lynda.com is a website which offers thousands of video courses across three broad categories; namely: software, creative and business skills. The website is ideal if you want to learn how to use the advanced features in Microsoft Excel, Adobe Photoshop, AutoCad or if you want to update your management skills and much more. There is a wealth of resources - just have a browse on the Lynda.com website to discover more. Bolton College's ILT Team has been exploring how conversational services such as Ada could be used to enhance the various elements that make up a typical online tutorial. We are pleased to announce that the College's Ada service can now support students and teachers with simple question and answer activities in an online tutorial. The following video offers a simple demonstration of the service. 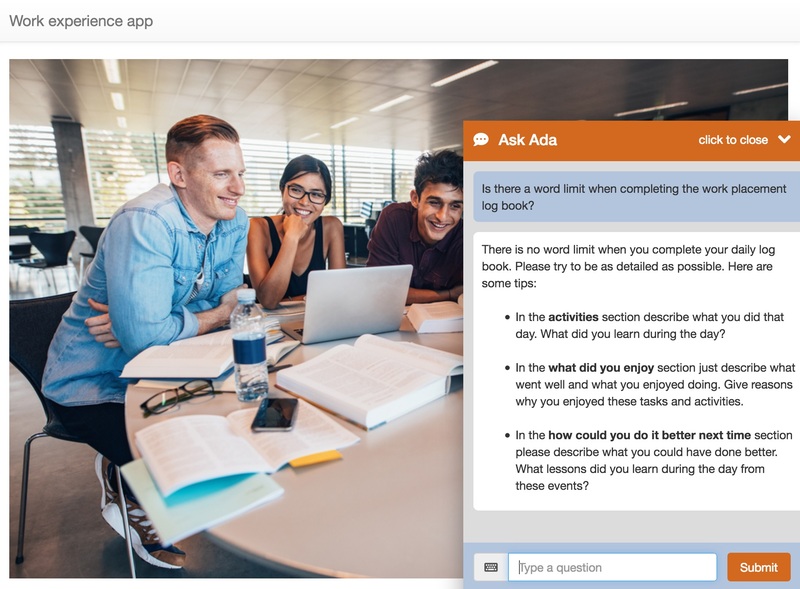 As you can see from the above video, the natural language processing capability of the ask Ada service enables teachers to pose questions that require students to answer in short form. From an instructional design perspective it enables teachers to use a medium that takes them beyond the traditional multi-choice question or drap-and-drop format that can be found in most online tutorials. When Bolton College's learning analytics, adaptive learning and conversational services are coupled together they offer our teachers and instructional design team the opportunity to design online learning and assessment materials that are much more responsive to the needs and demands of individual students - and to do so at scale. 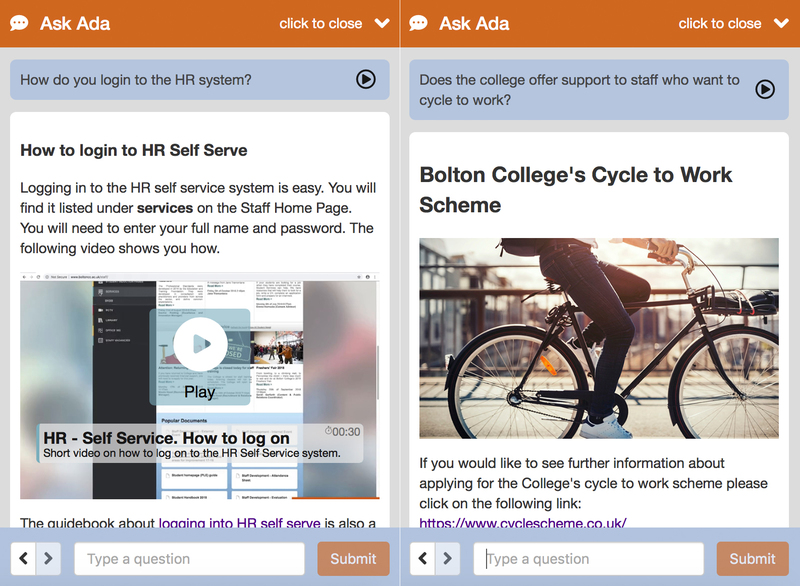 Bolton College's Ask Ada service is now supporting students and teachers in Moodle, the College's Learning Management System. Bolton College's Learning and Development Mentors are the first team to take advantage of the service as they deliver employability courses to over 2,000 students across the campus. The following video offers a simple demonstration of the Ask Ada service in an online tutorial. In this instance, the student starts an activity and asks Ada for help and support during the course of the task. Ada responds to questions using its natural language capabilities and offers the student text, images and videos in its responses. The Ask Ada service is built into all of the online tutorials that make up the employability courses for students at Bolton College. The College's employability courses are authored and tailoured to meet the needs of a diverse group of students and across all academic levels. it simplifies the design and production process of online instructional materials because Ada removes the need for some of the traditional interactions that are to be found in online tutorials. One of my favourite papers is entitled the Theory of Transactional Distance which was written by Dr. Michael G. Moore. In the paper, Dr. Moore describes the distance that exists between online instruction and the classroom. 'It is the separation of learners and teachers that profoundly affects both teaching and learning. This separation leads to special patterns of learner and teacher behaviours. With separation there is a psychological and communication space to be crossed, a space of potential misunderstanding between the inputs of instructor and those of the learner.' 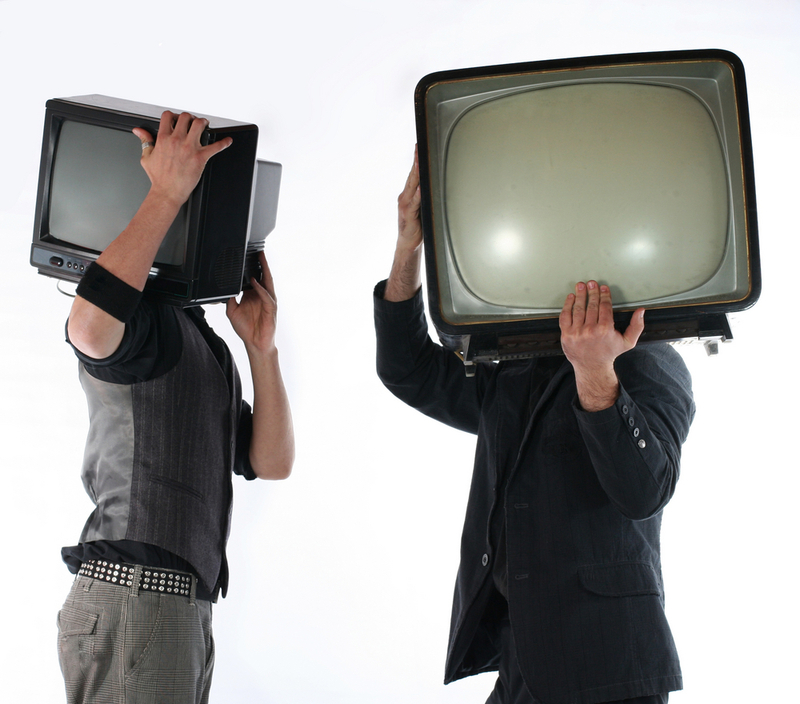 In many ways online courses are a simulacra or a false copy of what happens in the classroom. The theory of transactional distance provides guidance to teachers and instructional designers on how they can design the online element of their courses so that it minimises transactional distances and thereby maximises learning outcomes. Bolton College's use of cognitive services; and in particular conversational services, is an attempt to reduce the transactional distance between student and teacher. 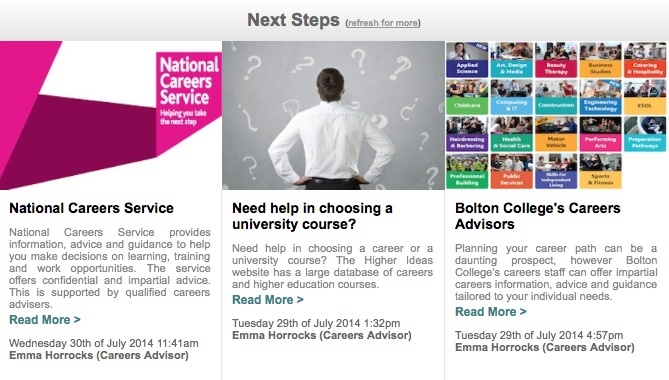 Bolton College's Ask Ada service has had a successful start to the new academic year. During the first week of the new semester, Ada responded to over 2,500 questions from students. The service continues to respond to hundreds of enquiries each day. As anticipated students are asking about their new timetables, dates and times for their maths and English classes, enrolment details, induction information, the opening hours of the College library, College opening hours, instructions for uploading assignments to Moodle - the College's learning management system and more. Elsewhere, Ada continues to support teachers to deliver the College's employability curriculum. The ask Ada service is embedded in each of the online employability tutorials that we have on Moodle. The service has been designed to support students as they undertake each online tutorial - answering questions relating to the topics and themes covered in each tutorial. Bolton College has successfully completed its application to join IBM's With Watson App program. The With Watson App program is an application verification program designed to provide exclusive brand, business, and technology resources to developers and organisations that are embedding Watson technologies into their services. The With Watson program has enabled Bolton College to verify and validate its Ask Ada service; an online cognitive assistant for students, teachers and support teams. 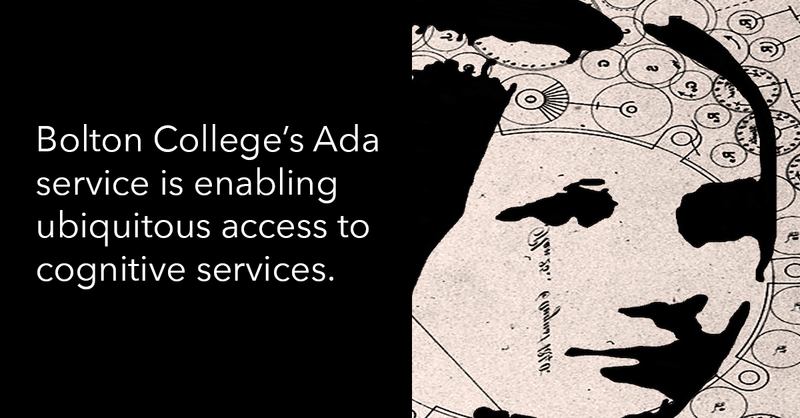 The Ask Ada service takes advantage of IBM's Watson cognitive platform; which enables the College to use the company's natural language processing technology. Entry to the With Watson App program allows Bolton College to use the With Watson branding as part of the Ask Ada service. Members of the IBM Watson Conversation Team visited Bolton College to view Ada - Bolton College's digital assistant for students, teachers and support teams. Students from the College's second year HND Computing programme have been involved in teaching Ada how to respond to questions from fellow students. The project has given them the opportunity to explore natural language processing and the world of digital assistants. With the support of IBM's Watson Conversation platform Bolton College has been able to offer a digital assistant to support students, teachers and support teams with day-to-day queries or tasks. In the following anonymised example, a student is able to view his or her qualifications by asking Ada. The service has enabled improved access to key datasets that students and colleagues enquire about during the course of the academic year. In this instance, it will offer value to students as they apply for new courses, apprenticeships, jobs or university. The digital assistant operates across a number of domains. At the present moment in time Ada is able to answer general questions about Bolton College; specific questions relating to the student who is asking the question and subject specific questions on Maths, English and Employability. Here is an overview of the questions that can be asked across these domains. When does the summer term end? Where is the exams office? What are the contact details for Student Services? When is the trip to Chester Zoo or to Blackpool? What's happening around the campus this week? What lessons do I have today/this afternoon/this evening/tomorrow? Where is my work placement? When is my next assignment due in? How am I doing with my studies? I need help with ratios/adding fractions or percentage changes. What should I wear for a job interview? In this instance the tutorial that is presented to the student is contextualised to meet the needs of the student. What is a verb or an adjective? I need help with referencing my work. I would like to arrange an appointment to see my subject teacher, tutor or careers adviser. I want to apply for an Engineering course - can you support me with my application? I want to make a payment for the course that I am doing - what's my outstanding balance? What grades do I need to achieve on my remaining assignments to secure an overall distinction grade for my course? Please message my teacher that I am going to arrive late for her class tomorrow because I have a dental appointment. Remind me to see my tutor at 2pm this afternoon. In these examples there is no need to open a calendar, there is no need to go the College website to view course listings, there is no need to complete an online application form, there is no need to open up a payments page on the College website, there is no need to open the application to view my overall grades on the course and there is no need to open up the messaging app. The College's ILT Team is examining how Ada could support teachers and students in the classroom. As we converse with Ada we are discovering that her place in the classroom presents colleagues at Bolton College with a number of exciting opportunities to enhance teaching, learning and assessment. The Information Learning Technology (ILT) Team at Bolton College has successfully deployed a number of digital assistants to support the delivery of learning and assessment materials to students. The use of these digital assistants has enabled the personalisation of teaching, learning and assessment at scale. Digital assistants can also be designed and deployed to enhance a range of other services that are used by students and colleagues. One of the projects that the College's ILT Team is currently working on involves the use of a digital assistant called Ada who is being taught how to respond to a wide range of student enquiries across multiple contexts. The ILT Team at Bolton College can now offer differentiated learning and assessment materials to students according to their learning support needs. In one recent example colleagues in the Careers and Learning Support Teams worked together to produce on an online tutorial which offered advice to students about applying for jobs and preparing for a job interview. The teams wanted to produce content that reflected the learning support need of the student viewing the content. For instance, if a D/deaf student is viewing an online tutorial on job interviews the student would see content that provided advice and guidance that reflected his or her learning support need. Students with other learning support needs would see content that is relevant to them. The important aspect of Bolton College's adaptive learning environment is that all students click on the same link to the job interview tutorial. Thereafter, the content is differentiated and it adapts according to the actions taken by the student within the tutorial. The use of learning support data enables Bolton College to offer its students with a much richer set of learning and assessment materials; material that is contextualised to meet the needs and demands of each student on the campus. Following on from a previous article entitled Start Learning the ILT Team at Bolton College is pleased to announce that it has successfully built a target setting service that enables teachers to set the tutorial or assessment activity that they wish their students to see when they next access their course on Moodle, the College's virtual learning environment. The new service provides an opportunity for colleagues to improve the way students access tutorials and assessment activities on the College's virtual learning environment. In a mature online course students are presented with a multitude of resources to support their studies. So finding resources can occasionally be frustrating. The new delivery model has the potential to change how students access learning and assessment resources on their online Moodle courses. From the student's perspective, the Moodle course may only be presented as a single 'Start Learning' image or button and nothing more. As students access their online course they simply click on the Start Learning image to access the latest tutorial or assessment activity on the course. 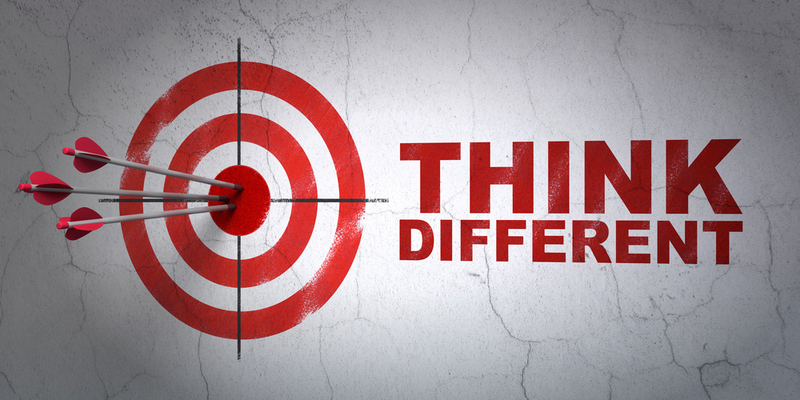 From the teacher's perspective, there is a large library of differentiated and adaptive content which sits behind each learning and assessment target set for each student. This iteration of the modern day codex enables course teams who have a large cohort of students and teachers; typically English and Maths programmes, to standardise the delivery of tutorials and tests. The ILT Team at Bolton College is currently researching how the College's adaptive learning environment could be used to improve the delivery of online tutorials and assessment activities to each of our students. One of the most promising options takes advantage of the target setting feature in our adaptive learning environment. In the following scenario students on a maths course are presented with a start learning image. Students click on the start learning image to access their next online tutorial or online assessment activity. Students will be presented with different tutorials and assessment activities according to the personal learning targets set by their course tutor. Later, as students return to their online maths course they will be presented with another tutorial and assessment activity that matches their next learning target when they click on the start learning image. The following diagram provides a very simplified representation of how online tutorials and assessment activities are presented to each student on Bolton College's adaptive learning environment. As well as querying an ever larger student dataset, the adaptive learning environment will learn from its failures and successes before presenting the most appropriate online tutorial or assessment activity to the student. Since this is an adaptive learning environment, the tutorials and assessment activities will flex, change and adapt according to the behaviour or responses elicited from the student during the tutorial or assessment activity. The delivery mechanism for presenting tutorials and assessment activities to each student can be automated. Bolton College's ILT Team is currently exploring this opportunity. The automation of this delivery mechanism is of interest on many levels. Firstly, it enables students to fast track through a course. Secondly, the pace of the course follows the progress made by each student. There may be times when a student accelerates through parts of the course. At other times, the student will proceed more slowly. The third and perhaps the most interesting aspect is the adaptive learning environment's ability to learn which of the tutorials and assessment activities in its content library work. The tutorial and assessment activities that perform well will be ranked high and vice versa. Over a period of time, students would be presented with tutorials and assessment activities that perform well. Fourthly, the delivery mechanism scales well. The solution copes well with a 100 students or 10,000 students. This would suit organisations who wish to harmonise and standardise the delivery of content and assessment across a large number of schools. Bolton College's adaptive learning environment is proving to be very versatile. One recent success has focused on the platform's ability to use target setting information to differentiate content and assessment activities on Moodle, the College's virtual learning environment. When a teacher and a student agree on a learning target, the tutorial (or SCORM package) that is presented to the student on Moodle reflects that new target. The use of target setting to inform content and assessment activities on Moodle are particularly useful for courses such as mathematics; were topics are well defined and discrete. For example, a target for learning equivalent fractions could be followed by targets for adding, subtracting, multiplying and dividing fractions. Content and assessment activities associated with each target will be presented to the student when accessing the maths course in Moodle. The result from each test that follows each tutorial will be presented back to the teacher and student to inform the next target on the course. Superficially, it may appear that students on the course will be presented with identitical tutorials and questions; but this is not the case. As students progress through each tutorial the content, questions and feedback that each student sees will adapt to reflect the progress being made by each student. The use of variables such as learning preferences and prior assessment scores will enable the content to be differentiated even further. Doing - you prefer to learn by doing things. Students can adjust their learning preference at any time. For instance, a student may prefer to learn by watching and listening in the morning and learn by doing in the afternoon. So when Bolton College's students open an online tutorial on Moodle, the College's virtual learning environment, the content and assessment activites that are presented to each student will reflect the learning preference of each student. As the adaptive learning environment collects data on learning preferences and identifies underlying patterns in the way learning preferences change over a given day, week, month or academic year; the adaptive learning environment can be used to automoate the delivery of content and assessment activities based on this data. For example, the data may indicate that students in a given profile have a preference for watching and listening to content in the morning. If this is a long term pattern that is predictable the adaptive learning environment can be used to assign content and assessment activities that matches the watching and listening learning preference for students who match that profile. The ILT Team at Bolton College has authored SCORM content that is gender specific on its Moodle Adaptive Learning Environment. 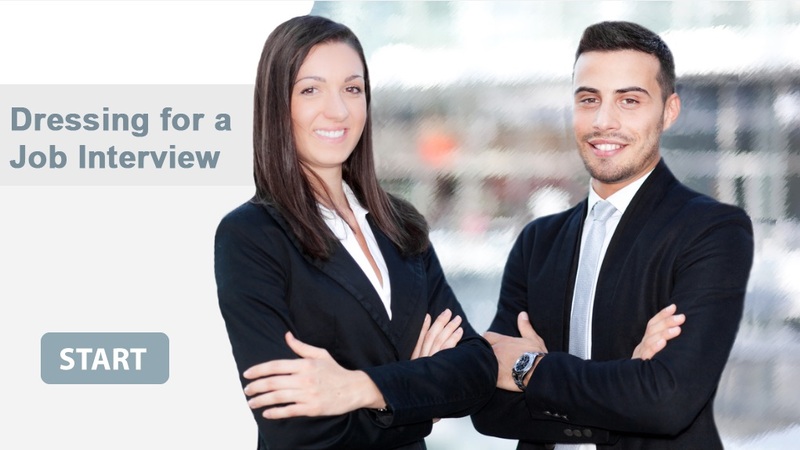 One of the recent tutorials that has been completed provides advice and guidance about dressing for job interviews. The tutorial is part of Bolton College's Level 2 employability course. The content is gender specific so the College's male and female students receive content that is specific to them. The adaptive learning environment also adapts content that meets the needs and requirements of transgender students and their preferred gender identify that is registered on the College's information management system. 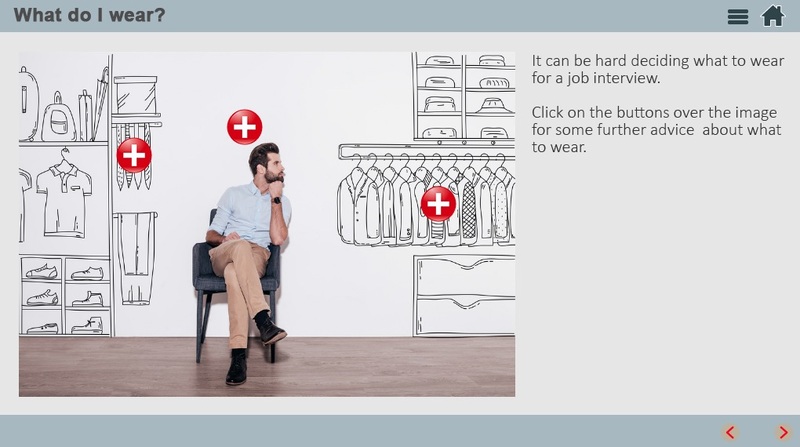 In the following example we have a slide that advises female students about what to wear for a job interview. In the slide shown below the advise is directed specifically at the male students within the College. The learning materials, videos and any assessment activities associated with the slide are all gender specific. Teachers and student support teams at Bolton College are working with the College's ILT Team to introduce a Virtual Digital Assistant into the classroom to support the delivery of the College's new employability unit. The employability unit will be delivered to over a 1,000 Level 2 students across all academic departments at the College. Teachers and support teams will continue to develop, author and distribute teaching, learning and assessment material via the classroom and via Moodle, Bolton College's Virtual Learning Environment; but in 2016-17, colleagues will be supported by the College's new Virtual Digital Assistant (VDA). 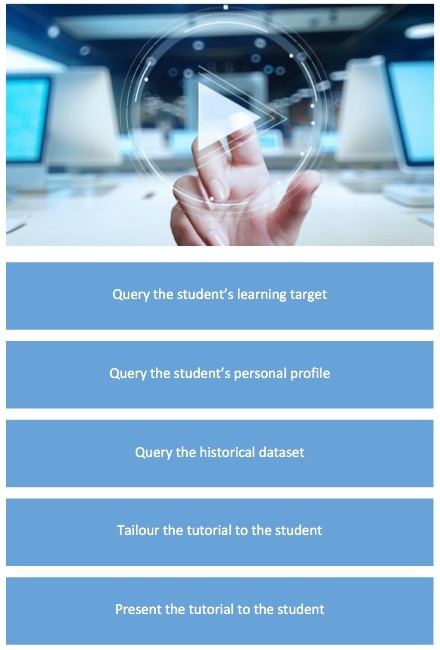 Put simply, the VDA is a suite of algorithms which query the student dataset to determine the most suitable teaching, learning and assessment material to present to each student on Moodle. The dataset includes variables such as student name, the student's unique ID, department name, course title, gender, entry qualifications for Maths and English, diagnostic test results, on-going assessment data, intended destinations and more. The VDA will support and enhance the delivery of the wholly online component of the Level 2 employability unit which currently stands at 18 hours. 36 hours of the unit will be delivered face-to-face by teachers and student support teams. Once the employability unit gets underway the VDA will act autonomously from the teacher and from the student support teams. However, it must be noted that the content and the algorithms that the VDA uses would have been authored by the wider course team. Course content and the VDA's algorithms will be amended as and when required during the course of the employability unit. My choice of image for this short article is intentional. As the manager of Bolton College's ILT Team I tend to be my team's biggest critical friend; and I recognise that our Virtual Digital Assistant is nothing more than a simple virtual machine. It may carry out hundreds and thousands of calculations per second when assessing the material to present to each of our students; and it may appear to behave intelligently because it always assigns the most suitable learning and assessment material to each student; but our VDA has someway to go before it becomes an indispensable tool for our teachers at Bolton College. One area for further development will be the use of historical data to inform the VDA. Historical data will include the assessment scores of previous students, assessment scores in relation to each student's profile and student profiling. Bolton College's adaptive learning and assessment environment delivers contextualised and personalised TV recordings and other video footage to each student via their Home Page and via the College's Moodle Virtual Learning Environment. The research and output has been showcased by the Educational Recording Agency in a recent case study entitled Up Close & Personal – the Adaptive Learning Environment at Bolton College. Our suite of algorithms now allow us to deliver differentiated content and assessment to students based on a wider set of variables such as gender. For example, the ILT Team has authored an employability tutorial that advises students about what to wear when attending job interviews. When students start the tutorial they are presented with gender specific slides. The use of such a variable in our algorithms in our adaptive learning and assessment environment enables the College's Careers Team to deliver content that is relevant, personalised and contextualised to the needs of each student. The research that Bolton College's ILT Team has been undertaking on adaptive learning and assessment environments has been showcased by Jisc in a case study. I also had the opportunity to present our research at a recent Jisc Connect More event which was held at Liverpool Hope University on the 21st of June 2016. Using learning analytics, the ILT Team at Bolton College implemented changes to Moodle to make it adaptive, giving teachers the ability to deliver differentiated, contextualised and personalised learning, as well as adaptive assessment. Bolton College has coupled Moodle SCORM packages with the wider dataset at the College. Now, when a learner accesses a SCORM package, Moodle interrogates the student’s dataset, which includes information such as learner ID, course title, previous assessment scores, entry qualifications and more, and determines the most appropriate learning and assessment material to present to each learner. The case study is entitled Improve Your Service Platform (May 2016). Adaptive assessment based on entry qualifications to a course: This is particularly useful when conducting diagnostic tests at the start of a course. The test that is presented to the student is based on the student's entry qualifications to the course such as a GCSE English or a GCSE Maths grade. The test adapts as the student progresses through the test. Adaptive assessment based on answers during a test: As each student progresses through an online test the questions presented to the student adapt to his or her responses. For example, if a student demonstrates that he or she can correctly answer questions at a particular level he or she will be subsequently presented with questions of a higher level. The reverse applies if a student struggles to correctly answer questions at a given level. Adaptive assessment based on previous assessment activities in Moodle: Students at Bolton College are regularly asked to complete online tests on their Moodle courses. The results of previous tests are used to inform subsequent online tests taken by each student. Moodle and the scorm packages that make up the online tests are able to instantaneously query the student, his or her unique ID, course title and previous assessment scores before presenting the most appropriate content to each student. Adaptive assessment based on course title: Occasionally students at Bolton College will undertake online tutorials that are also undertaken by other students across the College. The adaptive learning and adaptive assessment solution at Bolton College enables vocationally specific content slides and assessment activities to be presented to each student. This means that cross Colleges online tutorials on health and safety, induction or employability can be tailoured to suit the vocational interest of each student. teachers can easily track and monitor student progress via Moodle's gradebook. 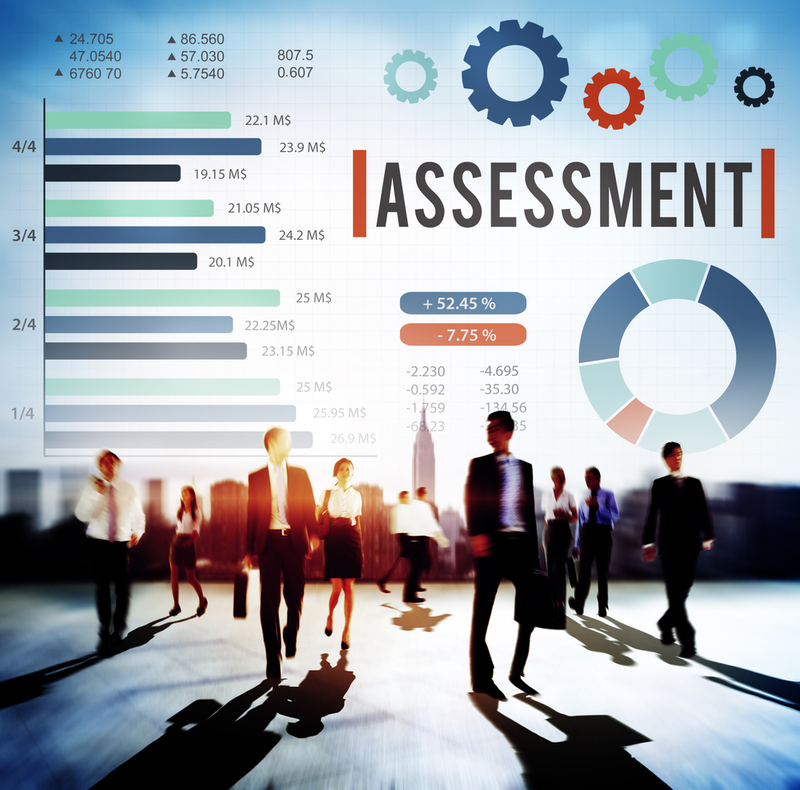 The ability to scale up adaptive assessment so that it is available to a wider set of courses remains a challenge. For now, colleagues are focusing on producing adaptive assessment materials for cross College programmes which are undertaken by many hundreds or thousands of students during the academic calendar. Teachers use virtual learning environments to author and distribute content to their students to facilitate independent study, blended or distributive learning. The limitations of most virtual learning environments mean that teachers are only able to author and distribute a homogenous set of content to their students; regardless of their students' academic abilities, prior learning, prior assessment scores or their chosen progression pathways. This means that most online courses contradict the best practice models of the classroom which promote differentiated, contextualised and personalised teaching, learning and assessment. Many of the world's largest MOOCs also fall foul of the same problem when they present the same content to their tens of thousands of online learners. The same can also be said for many of the courses that are hosted on Bolton College's Moodle virtual learning environment. The growing use of learning analytics to inform teaching, learning, assessment and student support at Bolton College has enabled the College's ILT Team to devise a solution to this issue that gives teachers the ability to deliver differentiated, contextualised and personalised teaching, learning and assessment via Moodle. The two main elements that make Bolton College's Moodle virtual learning environment adaptive are adaptive course delivery and adaptive student assessment. Firstly, adaptive course delivery seeks to use a student's personal characteristics and requirements to deliver bespoke content to that student. And secondly, adaptive student assessment seeks to use a student's prior qualifications or recent assessment scores to deliver tailoured assessment activities to that student. In the following example I explain how Bolton College's adaptive learning environment works in the context of a cross College online employaility unit entitled 'Interview Skills'. Adaptive Course Delivery - Bolton College has eight academic departments which reflect the various vocational programmes offered by the College such as computing, construction, hair dressing, healthcare or engineering. 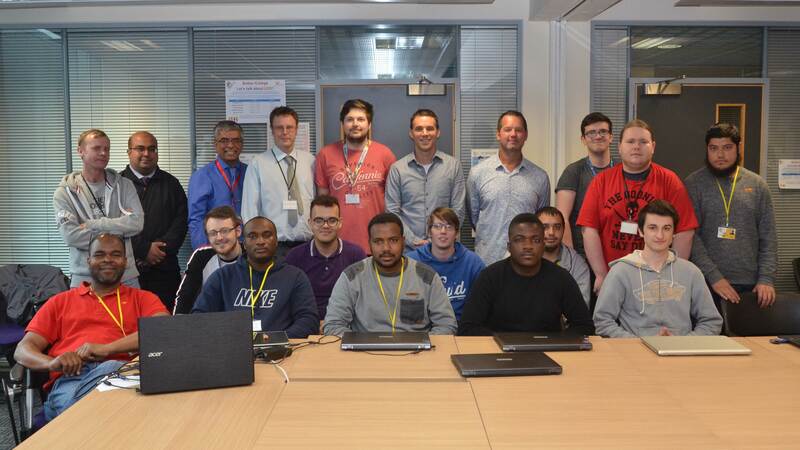 Students from across the College are enrolled on an employability course. As students from the different vocational areas open a Moodle scorm package on interview skills they all see the same introductory slides within the tutorial but as they progress through the tutorial they begin to see content which has been authored, adapted or differentiated to match their vocational area. For example, construction students see content relating to being interviewed for a job on a building site; and healthcare students see content that relates to being interviewed for a post as a hospital nurse. Additional slides may be viewed by students across all vocational areas and other slides may be vocationally specific. Adaptive Student Assessment - Students see assessment activities that relate to their vocational area. The points scored on the initial part of the assessment inform the type of questions or activities that are presented to a student in the second part of the assessment activity. A student that does well in the first part of the assessment activity is given questions and activites that further stretch and challenge the student. A student who scores poorly on the first part of the assessment activity is presented with subsequent questions and activities that reflect his or her initial assessment score. At all times the student is presented with online feedback that is based on medal and mission. The variables that can be used to inform each scorm package are broad and they originate from multiple datasets within the College such as the College's Moodle virtual learning environment, our Personal Learning Environment and the College's information management system. The list of potential variables include departmental names, course name, vocational interests, student name, gender, age, learning support needs, prior grades and assessment scores, career plans and content preferences; such as video, text, animation or interactive elements. One	of	the major benefits that can be derived from Bolton College's adaptive learning environment is the ability to personalise content on the larger courses that are undertaken by students and colleagues from across the College; such as induction, employability, maths, English, English for Speakers of Other Languages (ESOL) or computing. This is another example were the application of a wider dataset at Bolton College has either transformed existing services or created new services that benefit students, teachers and support teams. If you have any questions about Bolton College's adaptive learning environment please email me via Aftab Hussain. Bolton College recently established a service that enables teachers to record TV programmes and distribute them to students via Moodle, the College's Virtual Learning Environment. The College's licence with the Educational Recording Agency enables us to record and distribute TV programmes to benefit teaching and learning. 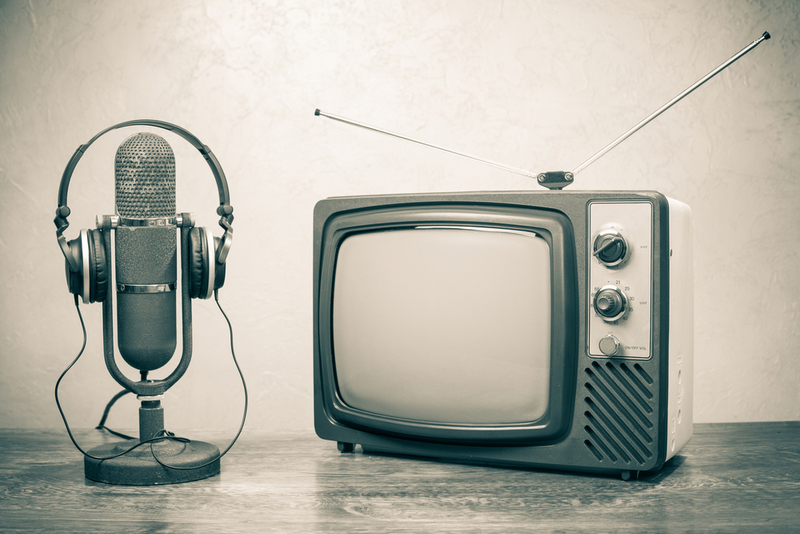 Teachers can record and upload TV and radio programmes from the list of members associated with the Educational Recording Agency such as BBC Worldwide Limited, ITV Network Limited, Channel Four Television Corporation, Channel 5 Broadcasting Limited and others. Recorded TV programmes are also distributed to students who belong to particular departments or to specific courses. 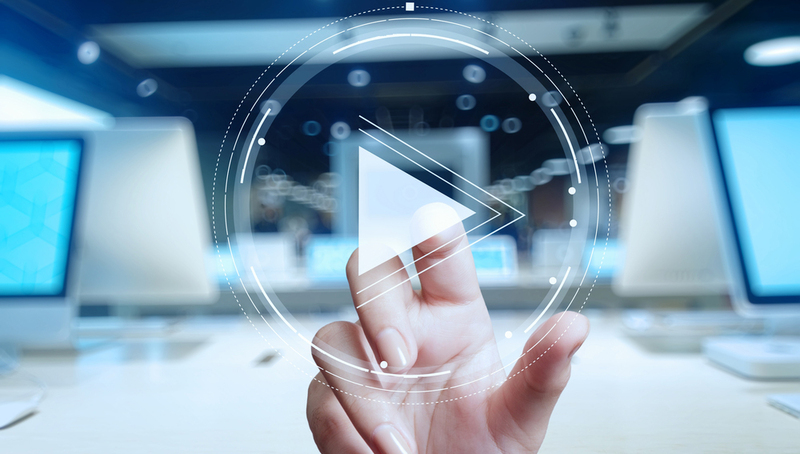 The ability to distribute personalised TV recordings in this manner increases the number of students who watch broadcasted material because the material is vocationally relevant to each student. In addition, students and teachers will be able to select vocationally relevant programmes to be displayed on their home pages via their personal profile on the College's wider service platform. Personalisation of the TV distribution service has resonance with the student body because it is relevant, appropriate and useful to their studies. It also increases the opportunities that students have to engage with or interact with their courses which ultimately supports student retention and the completion rate for courses. Data is playing a critical role in the development of new online services such as the College's TV recording and distribution service. The dataset which comprises the student profile has enabled Bolton College to design and deliver personalised and contextualised services to students in a manner that was not possible before. For example, the College's ILT Team is able to distribute TV and radio recordings on computing, artificial intelligence and the World Wide Web to all the College's computing students; and it is able to distribute TV and radio programmes on theatre, film and drama to the College's performing arts students. The growing use of student centered data means that many of the existing services such as the College's video library have been augmented, strengthened and become much more relevant to students and teachers across the College. we will continue to support teachers to record and post their own curated video content to the College's video library. Bolton College has established a service that enables teachers to record TV programmes and distribute them to students via Moodle, the College's Virtual Learning Environment. The College's licence with the Educational Recording Agency enables us to record and distribute TV programmes to benefit teaching and learning. Teachers can record and upload TV and radio programmes from the list of members associated with the Educational Recording Agency such as BBC Worldwide Limited, ITV Network Limited, Channel Four Television Corporation, Channel 5 Broadcasting Limited and others. The service complements other media services at Bolton College such as live TV streaming, video conferencing using BigBlueButton, webcam recording and the College's Medial video library. With the advent of these services Bolton College has seen a rise in the use of video to support teaching, learning and assessment. We also use video on the College's Student and Staff Home Pages to promote and publicise news and events across the College and to distribute information, advice and guidance to students. One of the challenges facing the Information Learning Technology and Learning Resource Centre Teams at Bolton College is to catalogue and tag video content to ease and improve search for students and staff across the College; especially as the video library grows. The College's video library is part of a much wider dataset which informs personalised and contextualised services on the Student and Staff Home Pages. In the near future students and colleagues will be able to view tailoured video content that reflects their courses and subjects of interest via their home pages. Appointments - Students and staff receive notifications about forthcoming appointments, locations and times. 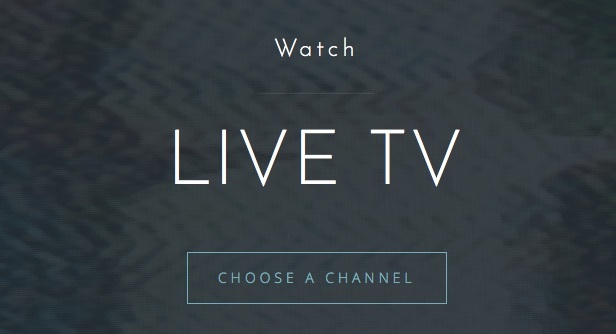 The Learning Technology Team at Bolton College has launched a live TV streaming service on the Student and Staff Home Pages. Visitors to the service currently have access to over a dozen TV and radio channels such as the BBC News, BBC 1, BBC 2, ITV and Channel 4 with plans to increase the number of channels in the near future. The service is accessible over desktop, tablet and mobile devices. The College's licence with the Educational Recording Agency enables us to record and distribute TV programmes to our students and teachers to support teaching and learning. Section 34 of the Copyright, Designs and Patents Act 1988 enables the College to stream live TV to students and teachers to support teaching and learning. Bolton College's live TV streaming service complements other services such as our video repository which enables colleagues to store and distribute recorded video content to students and teachers via Moodle, the College's Virtual Learning Environment. Teachers also have the opportunity to record and post webcam footage to their Moodle courses which enables them to introduce units, topics or assignments with webcam videos instead of using lengthy pieces of text to describe course elements. In addition, teachers can record and upload TV and radio programmes from the list of members associated with the Educational Recording Agency such as BBC Worldwide Limited, ITV Network Limited, Channel Four Television Corporation, Channel 5 Broadcasting Limited and others. The following video details the benefits of the Educational Recording Agency licence. Bolton College's Student Home Page is increasingly presenting contextualised and personalised services that are tailoured to meet the needs of each and every student at the College. The reliability of these services is dependent on the accuracy of each student's dataset. To that end the Learning Technology Team at Bolton College has created a service that enables students to update and edit their personal profile via their Home Page. The basic personal profile is composed of details such as the student's name, home address, phone numbers, email addresses, next of kin details, gender etc; but it also prompts students for other details such as career plans which informs the services that are delivered by College's Careers Advisors; dietary information which informs the range of food that is offered by the College's Catering Team and so on. 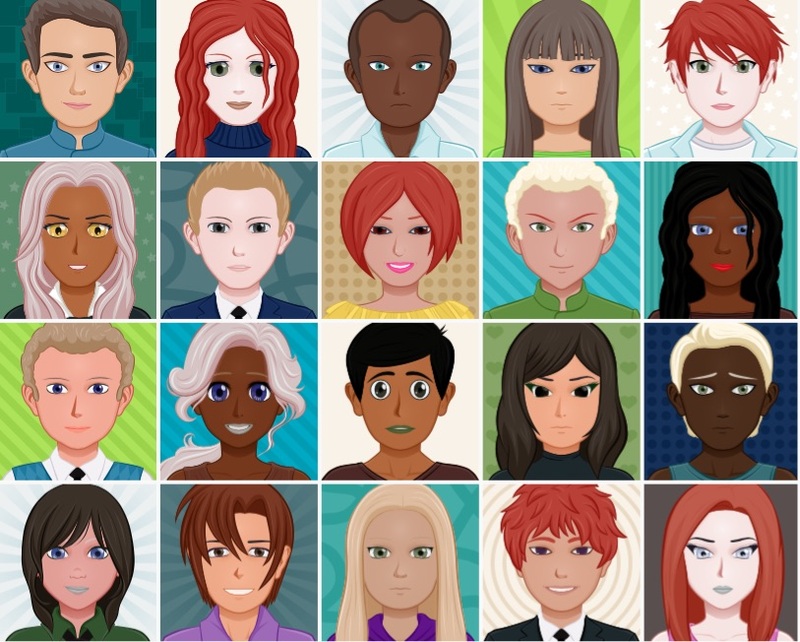 In order to encourage as many students as possible to update their details the Learning Technology Team at Bolton College added the SVG Avatar service to the editable profile. The use of the avatar has proven to be very successful because many hundreds of students updated their details via the Student Home Page soon after the launch of the editable profile on the 14th of March 2016. The editable profile has also been extended to the College's Staff Home Page which has resulted in numerous colleagues updating their College contact details such as office phone numbers, office room numbers, campus locations and so on. The staff profile also provides colleagues with an opportunity to tag their personal profiles. Tags are used to inform other colleagues if you are a College First Aider, a Project Manager, a Maths Teacher or if you have a leisure interest etc. The editable student and staff profiles have been designed to be responsive so students and colleagues can access and edit their details via their smartphones. visitors to the site have access to a growing library of resources to support their studies. The website was designed with the support from Designers Up North. Further developments to the site will include an e-commerce solution which allow students to pay for services via the website. The Community Learning website will also utilise services that are already in use on the College's main student site; such as improved search engine services following further tagging of assets on the site and the development of contextualised services which are time and location aware. In January 2016 Bolton College will launch BigBlueButton as its classroom video conferencing service for teachers and students. The service was chosen because of its close integration with Moodle, the College's Virtual Learning Environment and the ease by which a teacher can set up each web conference. Students simply access the web conference via their course on Moodle. BigBlueButton is an open source web conferencing system which supports and enhances on-line learning. BigBlueButton enables our teachers and students to share documents, webcams, chat, audio and their desktop screens. It can also record sessions for later playback which can be accessed via Moodle and the Media Channel, the College's video repository. The following video showcases the teacher's viewpoint of BigBlueButton. For further videos on the service please refer to the BigBlueButton channel on YouTube. In January 2015 Bolton College became a Certiport Authorised Test Centre. The following video has been produced by the College's ILT Team to promote the Adobe Certified Associate program to students and teachers. A small group of teachers are currently participating in the initial pilot of the program. Students will have an opportunity to qualify as an Adobe Certified Associate from September 2015. In January 2015 Bolton College will become a Certiport Authorised Test Centre. Bolton College has been working closely with Prodigy Learning to deliver a programme which will enable the College to offer Adobe Certified Associate and Microsoft Office Specialist certification programmes to students and teachers. Certification programmes will be broadened in 2015 to enable Bolton College's STEM students and teachers to become Autodesk Certified Users. Students at Bolton College regularly receive messages, targets and updates on their unit grades from teachers via the Student Home Page. 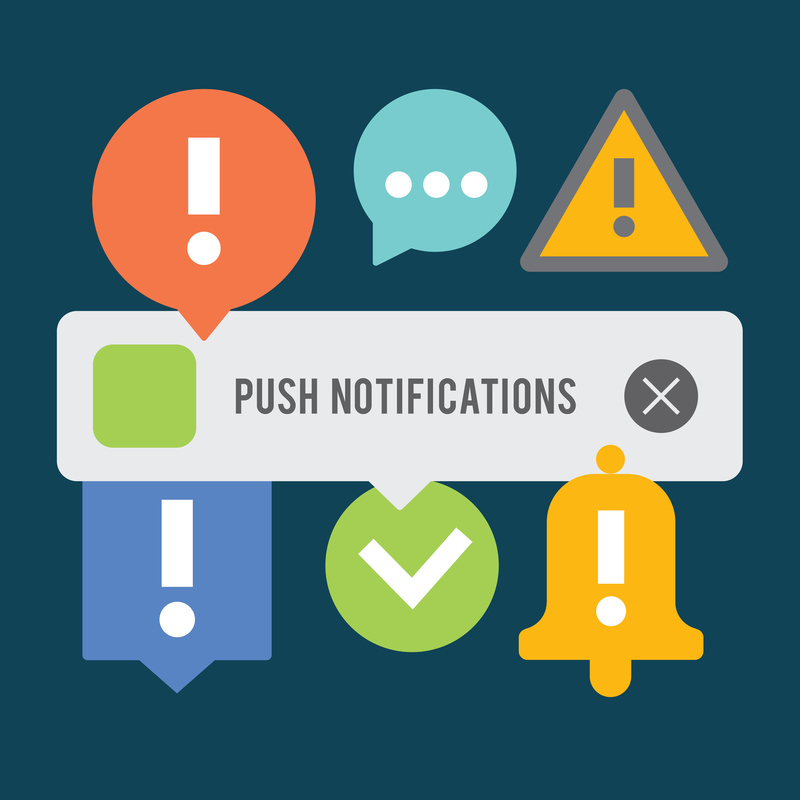 In November 2014 Bolton College launched its Push Notification service for students. Push Notifications have been designed to improve student engagement with key services on the Student Home Page. As services develop on the Student Home Page, Bolton College will use push notifcations to provide timely prompts to students on a wide range of information such as one-to-one appointments with teachers, exam date reminders and reminders about coursework submissions. The launch of the push notification service on the Student Home Page has increased the number of student visits to and interactions with priority services on the site. As always, the push notification servivce in available on desktop, tablet and on mobile. In October 2013 Bolton College launched its messaging service for the student and staff home pages. Since the launch of the service the ILT Team has recorded many thousands of messages per month between students and teachers across the College. What are the features of the messaging service? Students and teachers do not need to open up any client software to view their messages. Messages are accessed and displayed within the student and teacher home page. Teachers can message individual students or whole class groups. Students and teachers can reply to messages. Students can view all their sent and received messages for all of their teachers. Teachers can categorise messages as general messages, deadlines or submission dates, reminders or exam dates. Since the student and staff home pages are responsive messages can be viewed on desktop computers and on mobile devices. 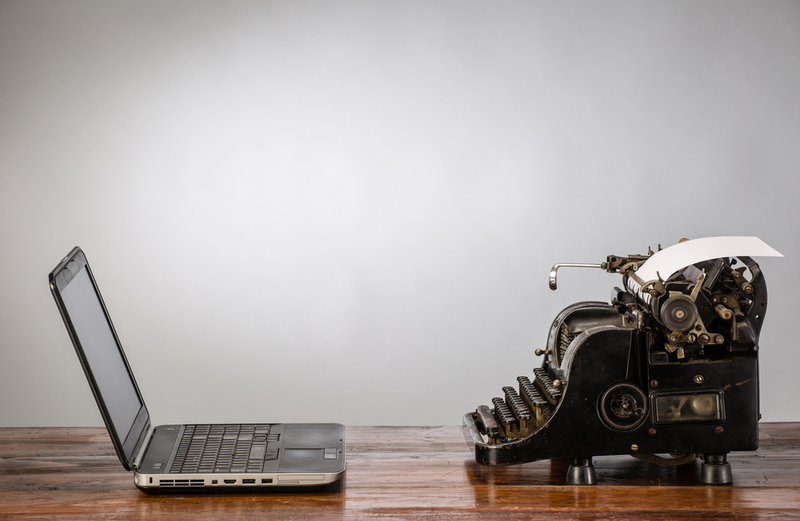 The interface for authoring a message is intuitive to use. Students and teachers simply type their message and click send. Students and teachers have stated that the messaging service has improved communication with teachers and students respectively and they use the service on a daily basis. Bolton College's text message service is proving to be an invaluable medium to communicate with students, parents, employers and the wider community. The solution from Blackboard ConnectTxt has enabled the College to utilise the text message service in a wide varierty of contexts. The College's student recruitment and marketing teams message new and potential students to the College. The following video highlights the features that are utlised by Bolton College through Blackboard ConnectTxt. The Media Channel at Bolton College is the video hub for students and teachers. The College recently added 143 maths videos to the Media Channel. These videos were produced as part of the award winning Maths Everywhere project. The following video was produced to raise awareness of the Media Channel to the College's 14,000 students. Bolton College's Student Home Page is typically visited by 3,500 students each day. Each one of them sees a different version of the Student Home Page. The ability to deliver personalised content to each student is a core element of Bolton College's online strategy, a strategy that seeks to enhance student engagement with key College services. We acknowledge that students visiting the Student Home Page go there for different reasons. Some of them are there to access their courses on the College's Moodle Virtual Learning Environment, others are there to access the library catalogue and some might be seeking information about progressing onto future studies or employment. 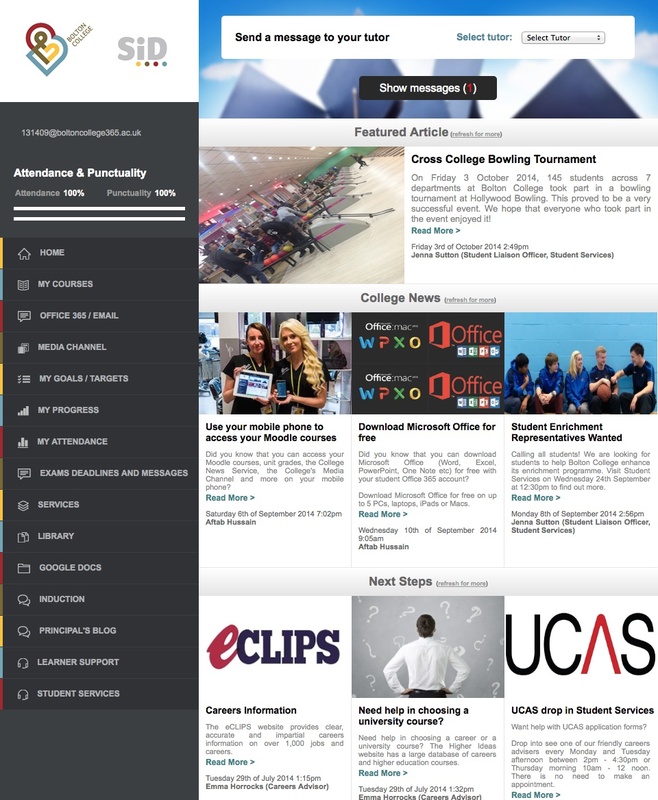 By creating a unique one-to-one student experience on the Student Home Page, Bolton College has managed to create an environment where its students are more engaged, which in turn has a direct and positive impact on their studies and upon the use of services that are offered by teams across the College. At the present moment in time Bolton College's Student Home Page is personalised according to a set of parameters such as the student's unique College ID number, their main course of study or the student's intended destination after the course. As the service develops, Bolton College will personalise the Student Home Page according to the actions performed by students on the page. For instance, if students click on the Apprenticeship vacancies news feed they will be presented with information relating to the Student Job Club which can support their application for the post. The responsive nature of Bolton College's Student Home Page means that targeted information and services can also be accessed by students on their personal mobile phones. Over the last few weeks the Information Learning Technology (ILT) Team at Bolton College has successfully implemented a number of updates to the College's Moodle Virtual Learning Environment. Students and staff at Bolton College have access to a mobile responsive Moodle platform. This enables students and colleagues to view course materials on their smartphones. Bolton College has access to a number of analytical tools which will enable the ILT Team to monitor, record and review the use of Moodle on student and teacher owned smartphones over the coming years. Bolton College's Device Plus One Strategy encourages the use of smartphones to access key College services such as Moodle. The Device Plus One Strategy will play a significant role in shaping Bolton College's device replacement programme. Ephorus Plagiarism Software - with the Ephorus plugin for Moodle, student work that is submitted via the Moodle assignment module is automatically sent to Ephorus. Ephorus scans student work for similarities and the report is available for teachers to view within the assignment module. Teachers can then advise students on the work that they have submitted. The Helix Media Library Moodle plugin has been added to Bolton College's Moodle Virtual Learning Environment. The plugin enables teachers to add or link to video content in the College's new Media Channel which was launched in August. Bolton College's Moodle course creation process has proven to be a simple and effective way to set up Moodle courses for the new academic year, import content from previous academic years and for enrolling students and teachers to their Moodle courses. Bolton College has adopted Ephorus, as its anti-plagiarism software tool to assist teachers in identifying where plagiarism in assignment work may have occurred. Ephorus identifies plagiarism of work from other essays that have been submitted within the college, other assignments on line, as well as from books, journals and websites. Ephorus is a great tool for teachers who are doing their best to tackle plagiarism but simply can’t check every document they receive. With Ephorus, teachers can guarantee the originality of submitted work. With the Ephorus plugin for Moodle, student work that is submitted via the Moodle assignment module is automatically sent to Ephorus. Ephorus scans student work for similarities and the report is available for teachers to view within the assignment module. Teachers can then advise students on the work that they have submitted. September 2014 marks a significant milestone in the delivery of mobile services for the 14,000 students and 700 staff at Bolton College. Student and Staff Home Pages. These pages serve as the main portal for accessing all college online services. The college Moodle Virtual Learning Environment. This enables students and teachers to access all teaching, learning and assessment materials associated with their programmes of study. The Media Channel. 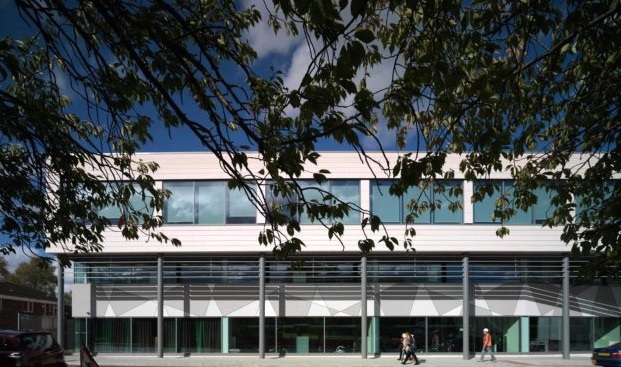 Bolton College has a growing library of videos that support a broad field of activities such as teaching and learning; the delivery of information, advice and guidance to potential, new and existing students and teachers; and to support publicity campaigns on the college's website. Student records. Students at the college can access attendance records, attainment records and more on their smartphones. News feeds. The Student and Staff Home Pages play host to a number of news feeds for students and staff at the college. The size of the college means that there is a steady stream of news that is posted daily to the news feeds. Office 365. The ability to access Office 365 services over a smartphone supports the college's strategy for delivering ubiquitious services to all students and staff at the college. Other mobile services include the ability for students to access schemes of work, assessment schedules, exam deadlines, messages from their teachers, the Principal's blog and more. In September 2014 Bolton College will roll out Office 365 for its 14,000 students and 1,000 staff. As well as being able to check their emails, students will be able to access their College OneDrive where they can create, store and share Microsoft Office files. It also includes a suite of Microsoft Office applications which can be downloaded onto a variety of devices and is completely free of charge during the time that students are enrolled with the College. Word 2013, Excel 2013, PowerPoint 2013, OneNote 2013, Access 2013, Publisher 2013, Outlook 2013, Lync and InfoPath 2013. Word 2011, Excel 2011, PowerPoint 2011, Lync and Outlook 2011. In August 2014 Bolton College will launch Helix Media Library as its new media streaming service. The Moodle Plugin enables our teachers to post and upload videos from our Moodle VLE. The user interface provides for a great user experience for all our students and teachers. The interface complements our device plus one strategy. Students and teachers will be able to access videos over the traditional desktop and tablet device as well as over their personal smartphones. Our student and teacher home pages are already mobile friendly. The Helix Media Library server will deliver improved media management which means that our videos can be used to their full effect within Moodle and on the College's external website. 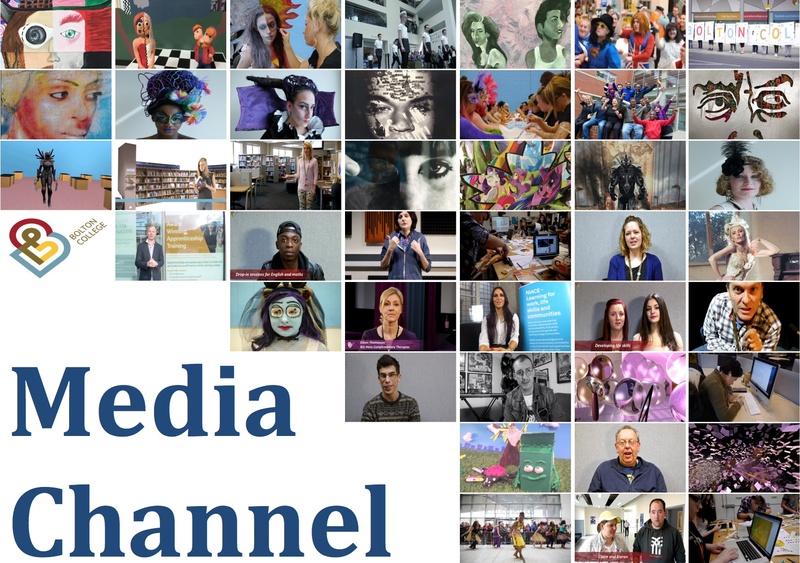 The ILT Team will be launching a Bolton College Media Channel for students and staff prior to the start of the new academic year in September 2014. The Media Channel will act as an aggregation site for all videos that are created by students, teachers and teams across the College. The Media Channel will also be used to showcase our social media channels such as Twitter, Flickr and our College YouTube channel. The Media Channel will be available via the Student and Staff Home Pages on desktop PCs/Macs, laptops, tablet devices and smartphones. Bolton College's Next Steps project will deliver targeted Information, Advice and Guidance (IAG) to all students in order to support their progression choices whilst studying at the College. When the project rolls out groups of students from across the College will receive bespoke IAG that reflects their current programme of study and their intended destination routes. Hence a Level 1 Construction student will receive IAG about Level 2 Construction courses. A Level 3 IT student will receive IAG about progressing onto Higher Education or about local job opportunities. Likewise a student who is undecided about a future career path could receive IAG about a broad range of courses and career options before making a decision about their next steps. The use of algorithms will determine the assets to be displayed on each student's Home Page. Every student will have a unique set of Information, Advice and Guidance presented to them on their home page which will reflect their personal needs, requirements and future plans. Bolton College's Next Steps project is one of many services that will deliver tailoured, bespoke and targetted information to students and teachers. As the student home page continues to develop students will be presented with information that is increasingly specific to them. General information will include services such as the College news section which provides general news about what is happening around the College. Other general services currently include services such as the College library, student services, learner support and the Principal’s blog. Targeted information will include services such as the the Next Steps section which will deliver targeted information, advice and guidance and which will reflect the Programme Area, section and level of the course being studied by the student. Other services that fall into this latter category include Moodle, the College's Virtual learning Environment and the College's Learner Management System which delivers unit grades, attendance records, progress data etc to each student at Bolton College. Services that currently deliver general information will be developed further to deliver more bespoke services to students and these will include the College's library management system and Bolton College's Media Channel. In March 2014 the ILT Team commenced work to develop responsive websites that would enable students and teachers to access key services over their mobile devices. Bolton College commissioned e3Creative to produce the artwork and graphics for the new student and teacher facing web pages. The design brief stipulated that the artwork and user interface had to lend itself to the new responsive interface and above all it needed to enhance the experience for all our students and teachers when accessing services to support teaching and learning across the college. 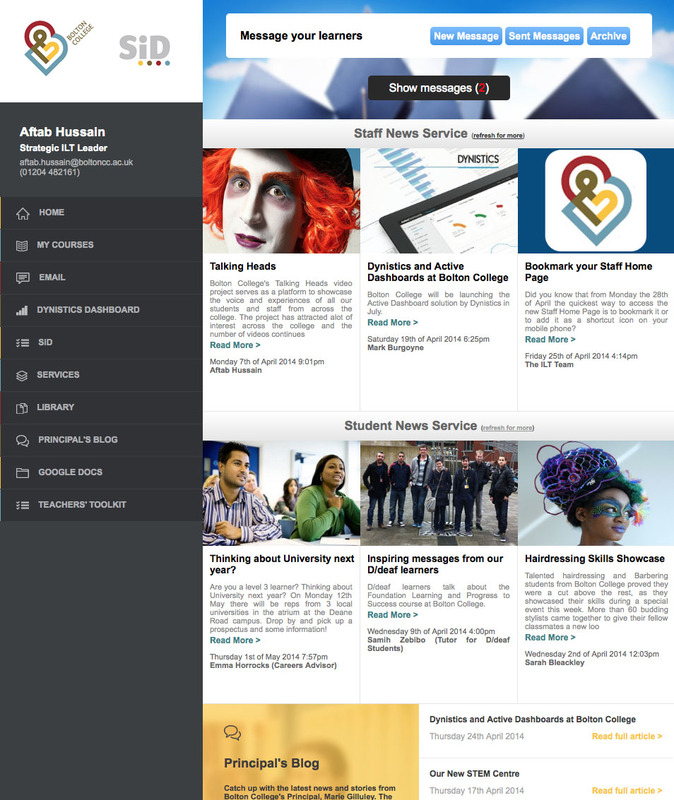 Bolton College has successfully migrated a wide range of student facing services across to the new responsive interface. These include the student and staff news services, the college's student-teacher messaging service and the student support pages. The responsive website also gives students the opportunity to access their assessment records and targets associated with their course(s). The new sites went live on the 28th of April 2014. The college Virtual Learning Environment (Moodle) will join other responsive services in July 2014. Bolton College is promoting the use of the mobile friendly interface through a number of promotional campaigns. We used Video Scribe to generate the following promotional Student Home Page video. 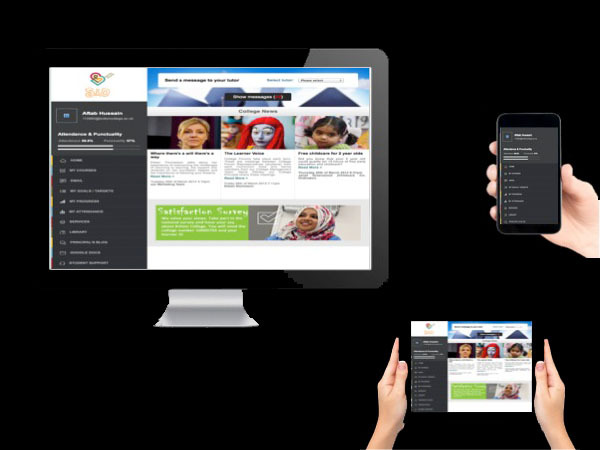 The move to a responsive design for the student and staff websites at Bolton College has enabled the College to realise benefits on many levels. Students show a preference for using their mobile phones to support their studies. Students have stated that they would access Moodle resources more readily over their own mobile device. Mobile devices are always on and always with the student so this reduces classroom delays in accessing networked services over traditional devices such as a laptop. The intimacy and immediacy of using a smartphone also promotes the use of the smartphone in the classroom. The cost of developing and delivering services for a mobile platform are lower. If students show a preference for accessing learning materials and other online services over their own smartphones Colleges like Bolton College will need to review the volume and tyes of devices that they purchase; especially when ubiquitious computing is achieved by students actively using their personal smartphones to support their studies. The ability to access Moodle course materials via a smartphone and to be able to access additional information on the same device adds tremendous value to the overall teaching, learning and assessment experience for students and teachers at Bolton College. Please note that Bolton College is still investing in productivity devices such as desktop computers and laptops to support students with their coursework. 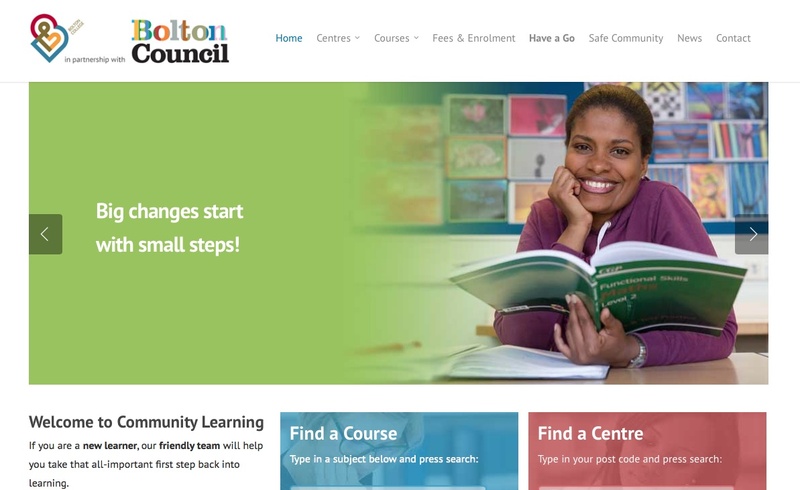 The launch of a responsive design for the student and staff websites has had a positive effect on the design and use of online services at Bolton College. Enhanced user interfaces have attracted positive feedback and this is reflected in the rising number of students and teachers who are using the platform via the desktop, laptop, tablet and mobile. 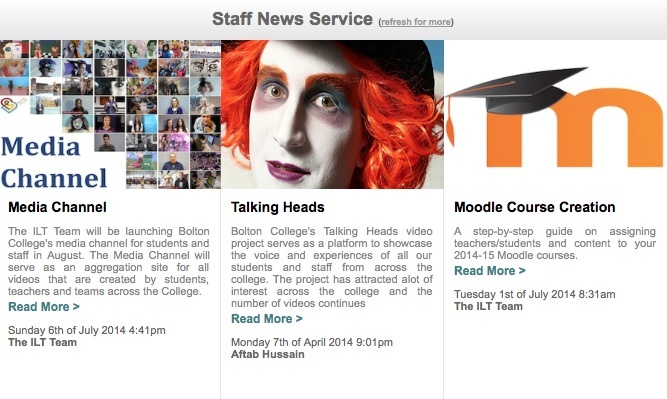 Bolton College's news service provides news from around the College. With one main campus and four Community Learning Centres there is never a shortage of news stories to share with students and colleagues. 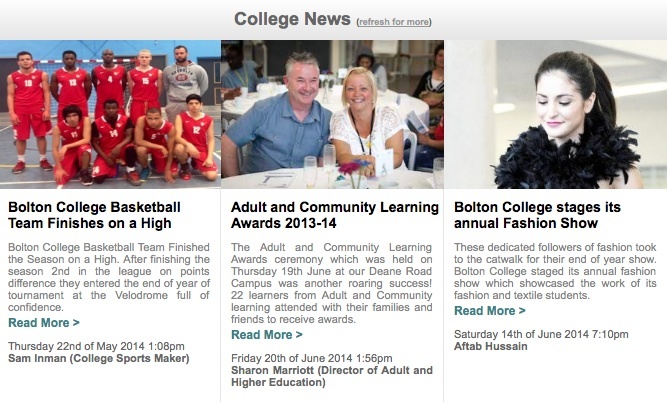 The main College news feed also acts as a social and historical archive for Bolton College. Archived news stories are accessible from any news story. Students have access to the College News Service via their home page. Staff have access to both the Staff News feed and the College News feed via the Staff Home Page. News stories typically include images, videos, surveys and links to internal or external websites. Students and colleagues can post comments on each news story and they have the option to click on the like button if they have enjoyed reading the news story. Site administrators can also view the number of visitors to each news story. 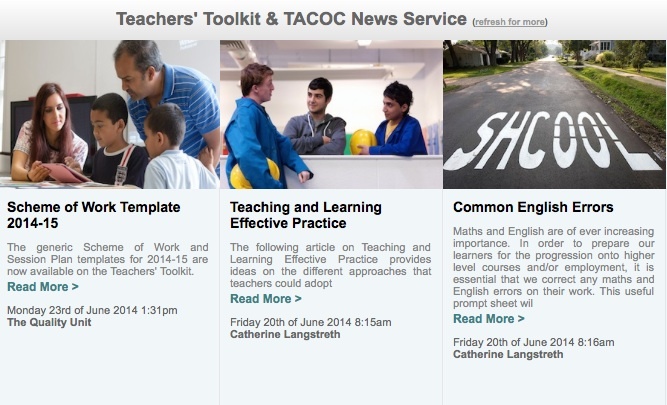 Bolton College recently established the Teachers' Toolkit news feed which enables teachers at the College to share good practice and resources with one another. Bolton College's Take a Chance on Change (TACOC) project also shares this news feed for teachers. TACOC is a successful and long running project at the College which encourages teachers to explore new forms of teaching, learning and assessment both in and out of the classroom. Other discrete news feeds will emerge as the Staff Home Page develops. Bolton College's Talking Heads video project serves as a platform to showcase the voice and experiences of all our students and teachers from across the college. The project has attracted alot of interest across the college and the number of videos continues to grow each month. Here is a sample of videos that have been produced by staff and students at Bolton College. In the following video students at Bolton College show off their skills in the Beauty, Make Up, Nails and Media Showcase for 2014. In the following video teachers provide a brief overview of the Art, Design and Interactive Media courses at Bolton College. In the following video we gain a brief insight about how D/deaf students feel about their studies at Bolton College. The 'Device Plus One Strategy' at Bolton College forms the basis for many of our ILT projects and services. Bolton College has a 2:1 ratio of full time students to networked devices. A programme to deliver a 1:1 device solution for all our full time students would be desirable but at the present moment in time it is not financially viable. Nevertheless, Bolton College has implemented a strategy to develop a range of mobile services which enables students to access services via their personal smartphones regardless of mobile operating system, screen size or web browser. The Device Plus One Strategy delivers ubiquitous access to College services and more importantly it delivers ubiquitous learning for all our students and teachers. If you wish to learn more about ubiquitious computing please refer to the article entitled ambient colleges. The success of Bolton College's Device Plus One Strategy is dependent on our ability to create an intuitive and attractive set of services that can be readily accessed over a wide range of smartphones. Initial feedback from students and teachers has been encouraging. Bolton College utilises a number of analytic tools to monitor the types of devices and operating systems being used to access our online services. During the course of the 2014-15 academic year we will monitor how our online services are accessed and we will take appropriate measures to adjust our change management strategy when promoting our mobile friendly services to students and teachers across the College.